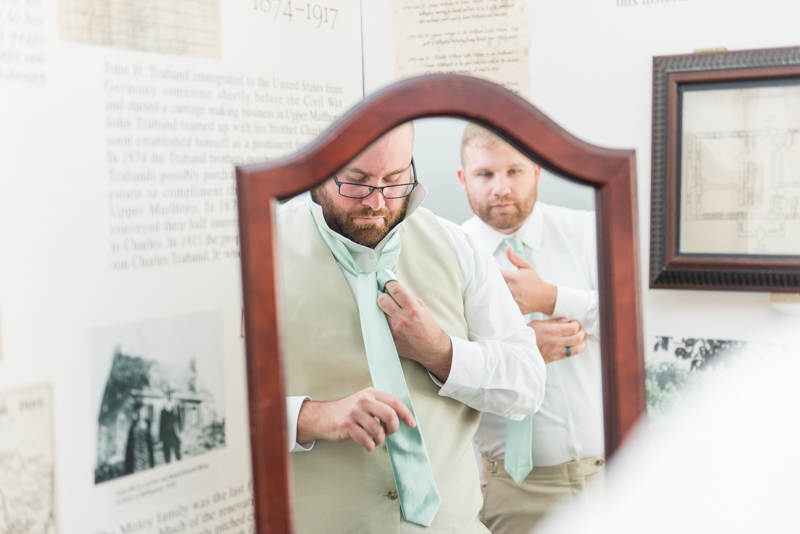 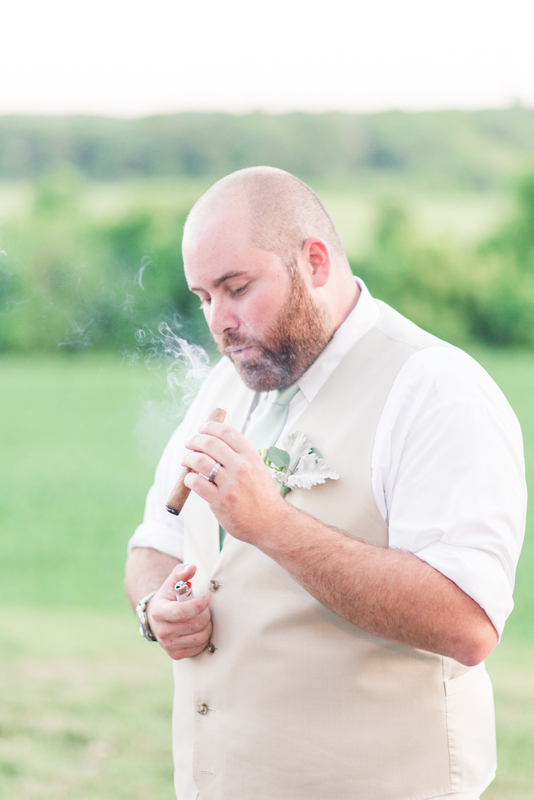 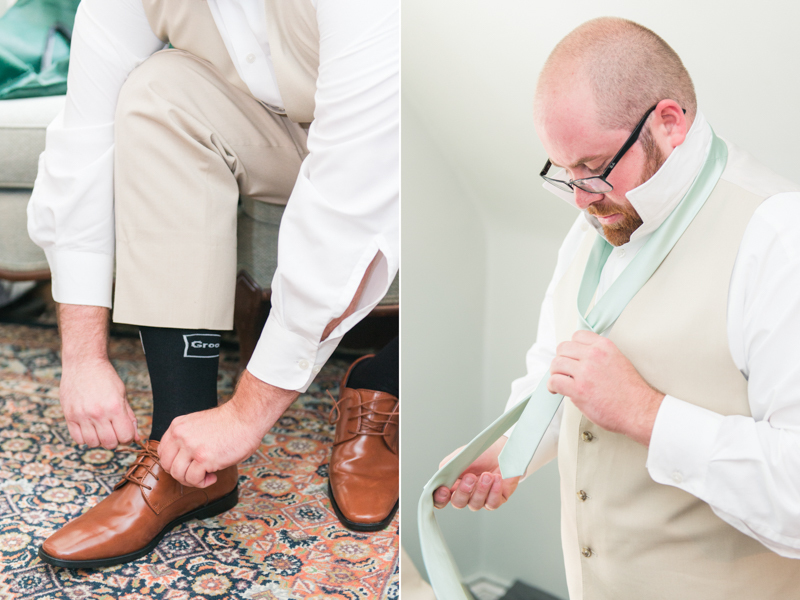 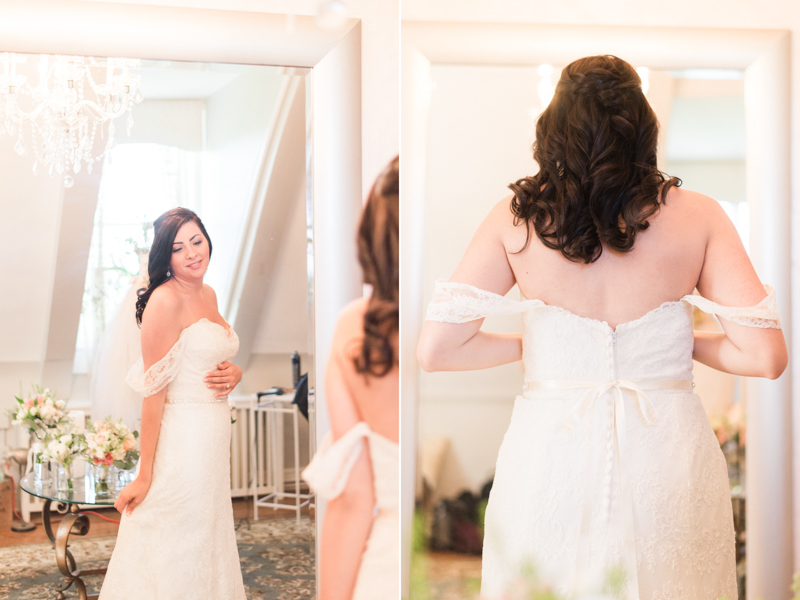 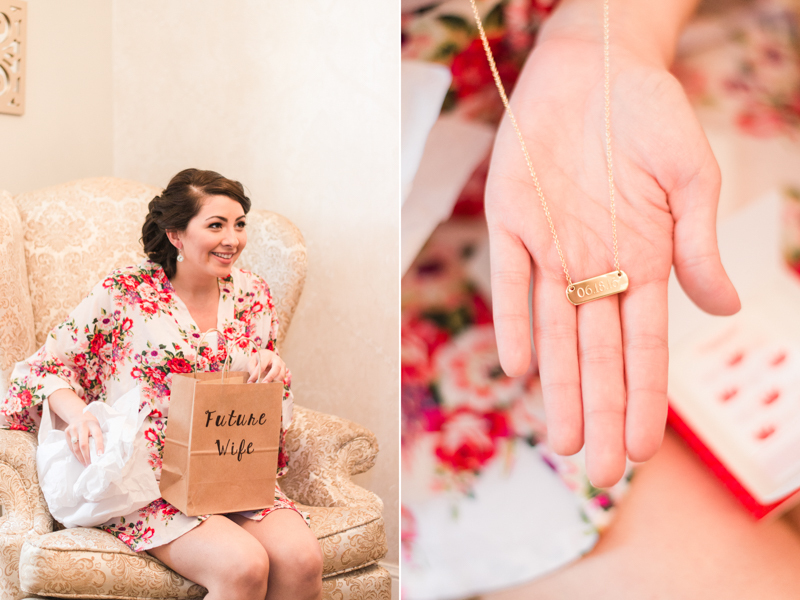 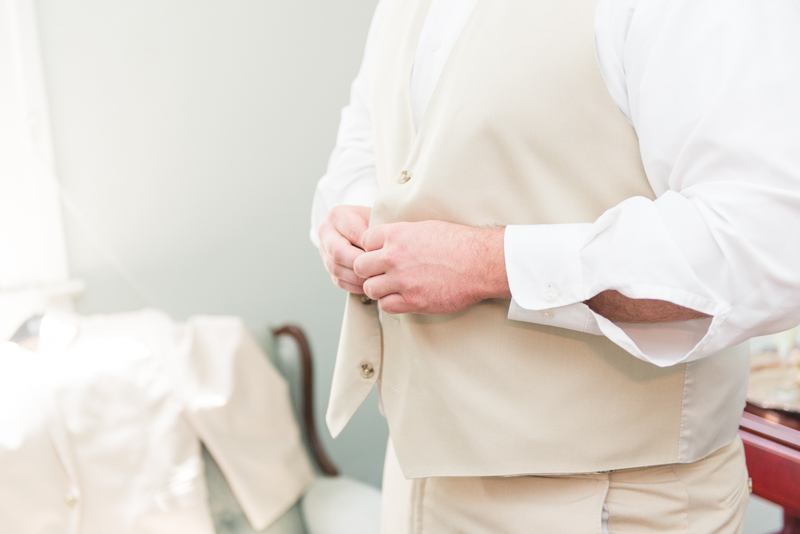 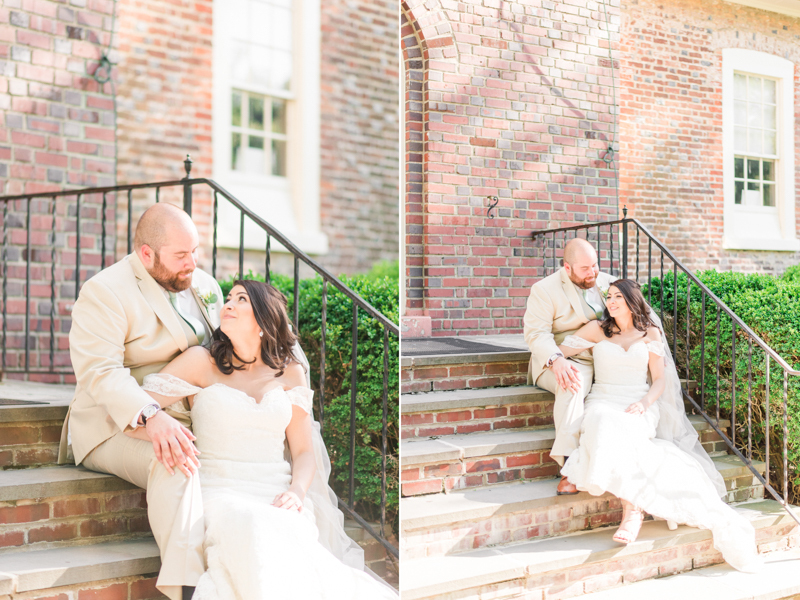 I had been ready for Alyssa and Matt's wedding since we shot their engagement session last year. 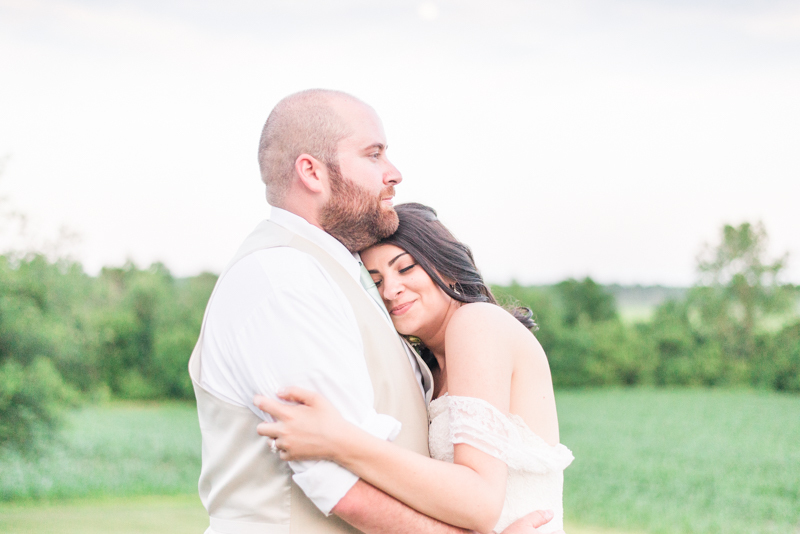 Not only are they incredibly sweet and kind to others, but they have such an amazing connection with each other. 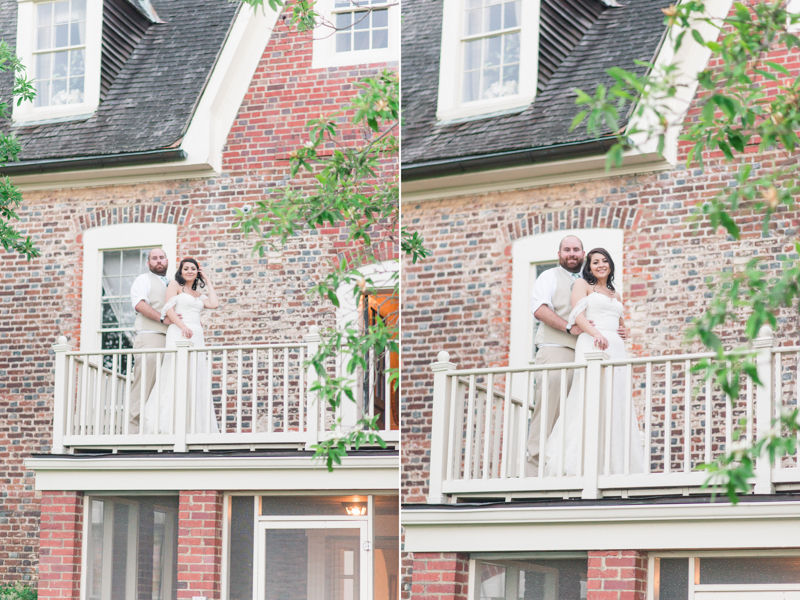 It was easy to tell they were dear friends right from the very start. 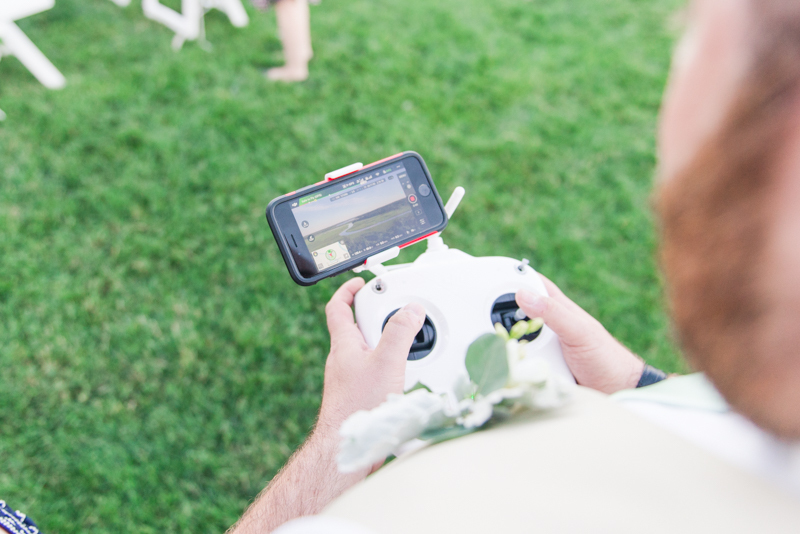 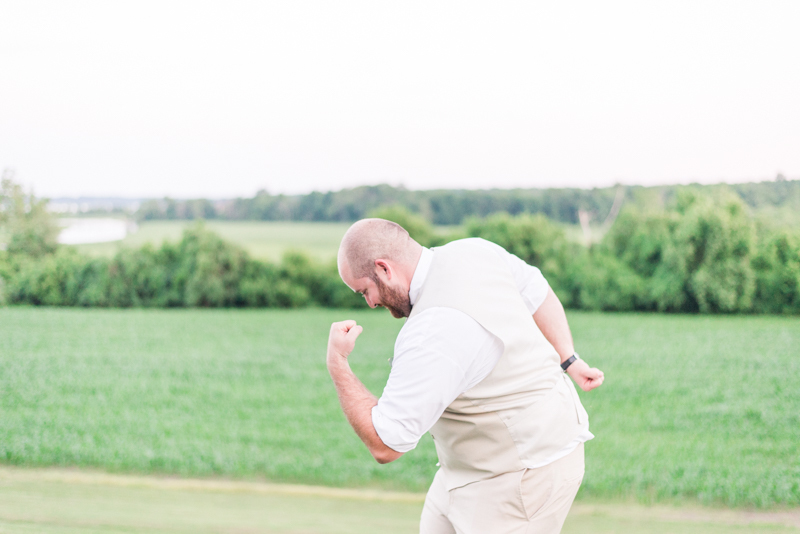 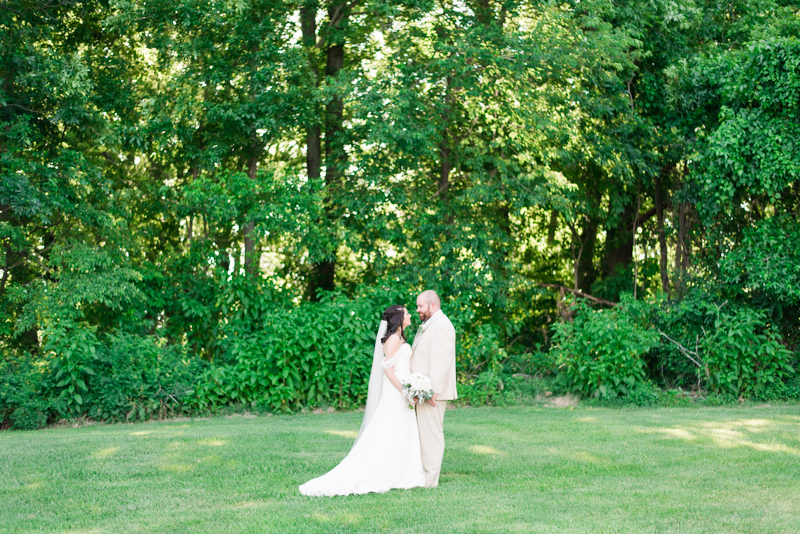 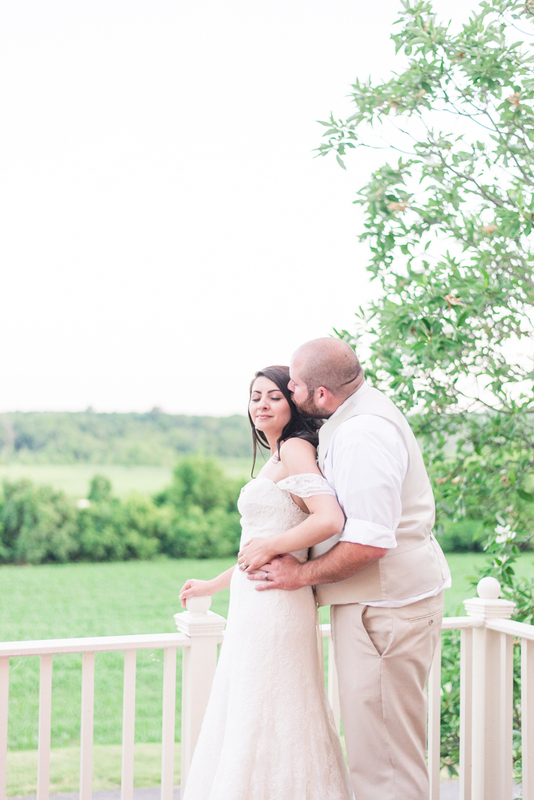 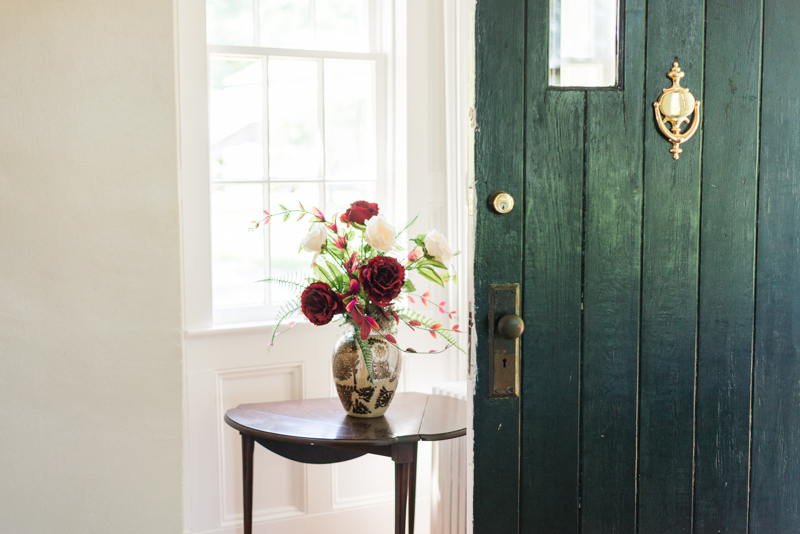 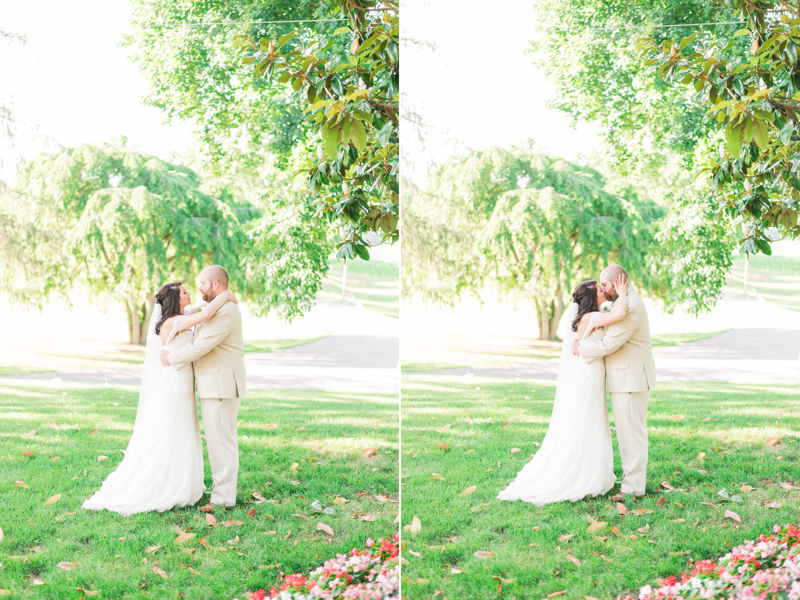 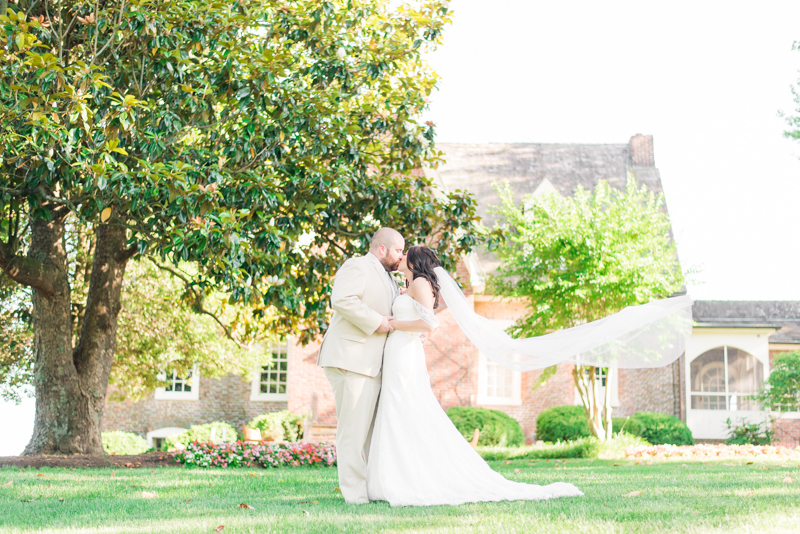 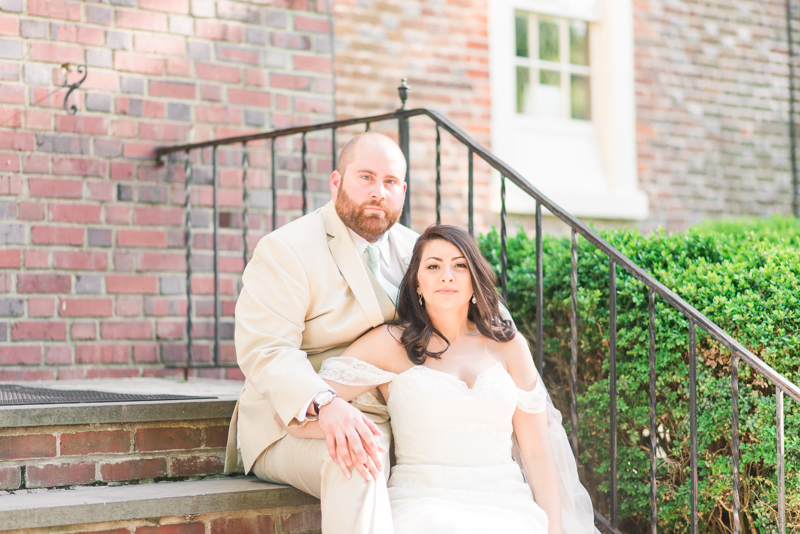 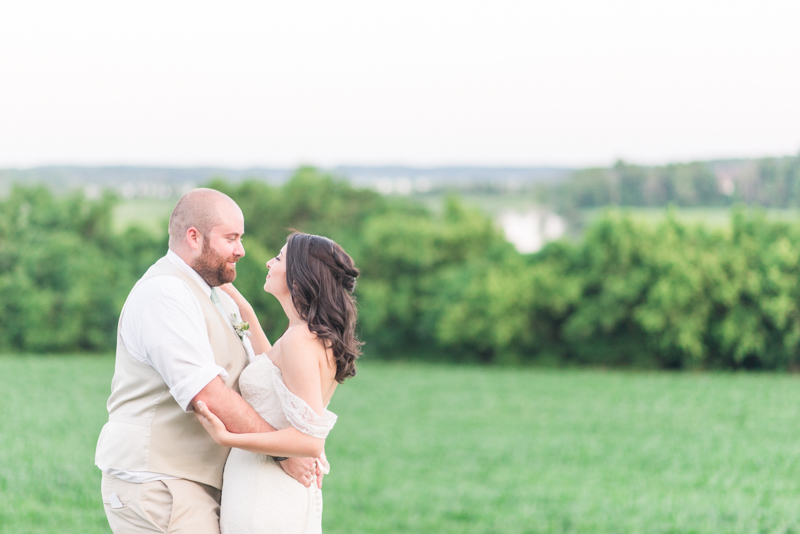 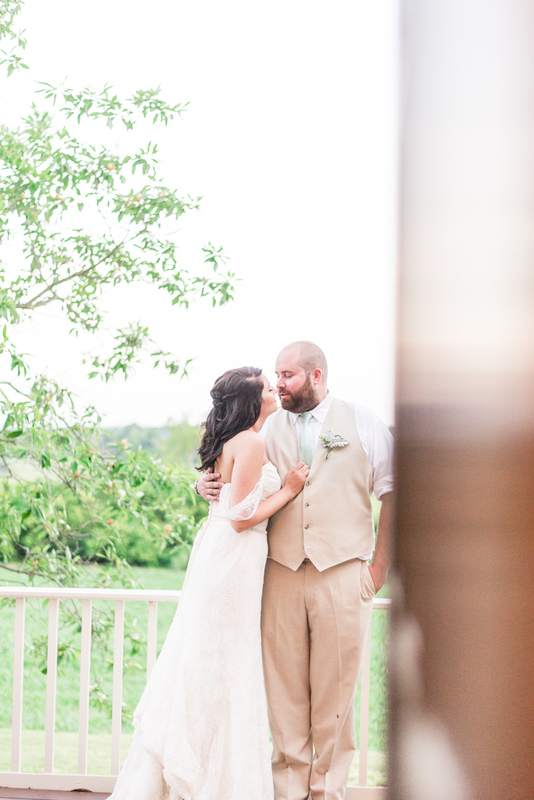 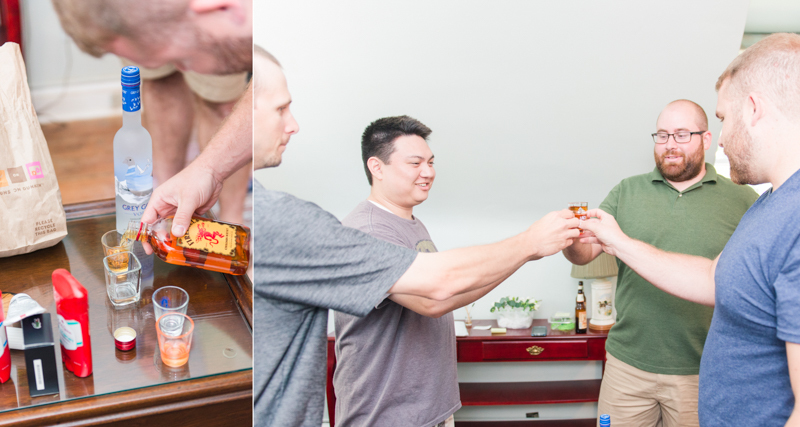 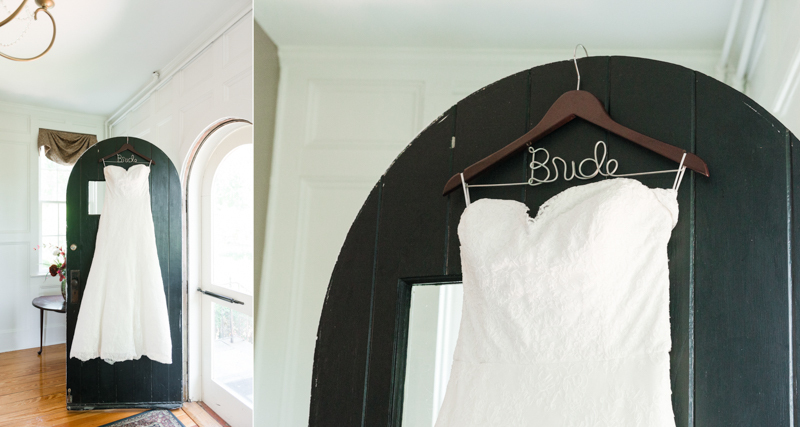 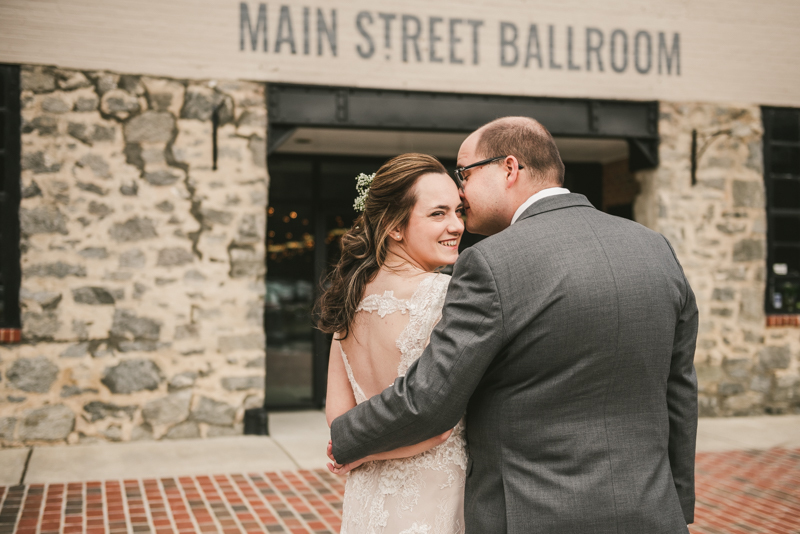 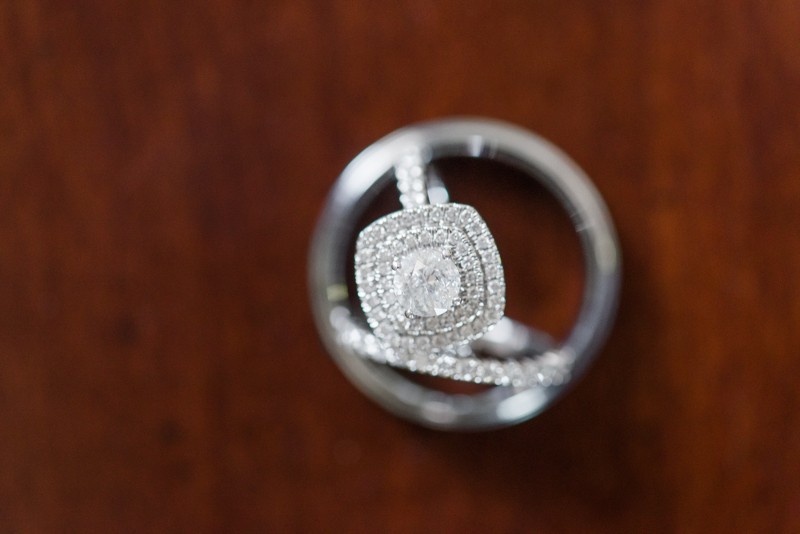 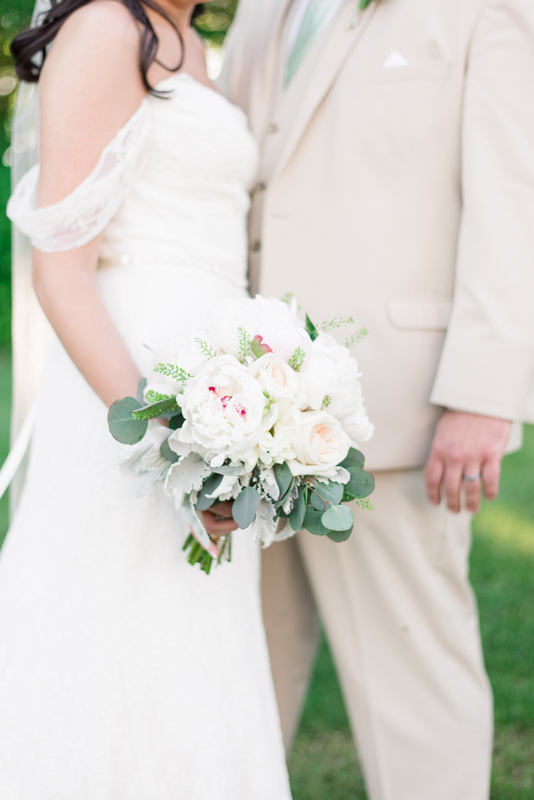 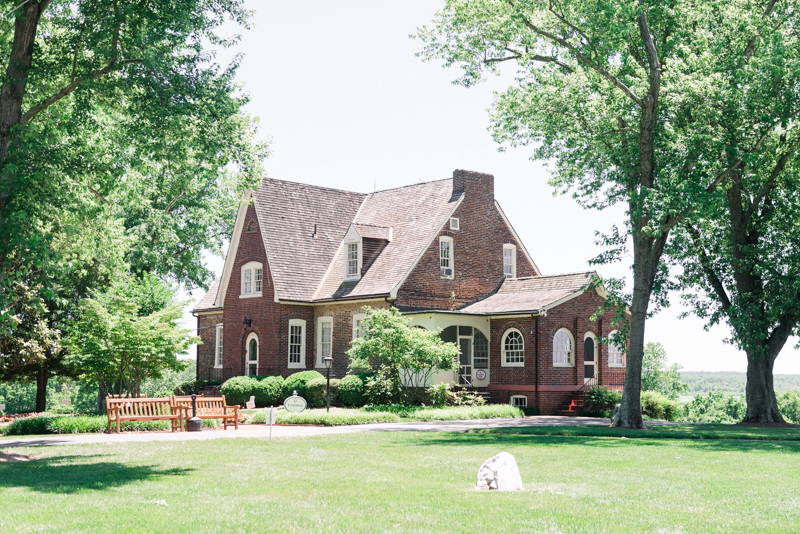 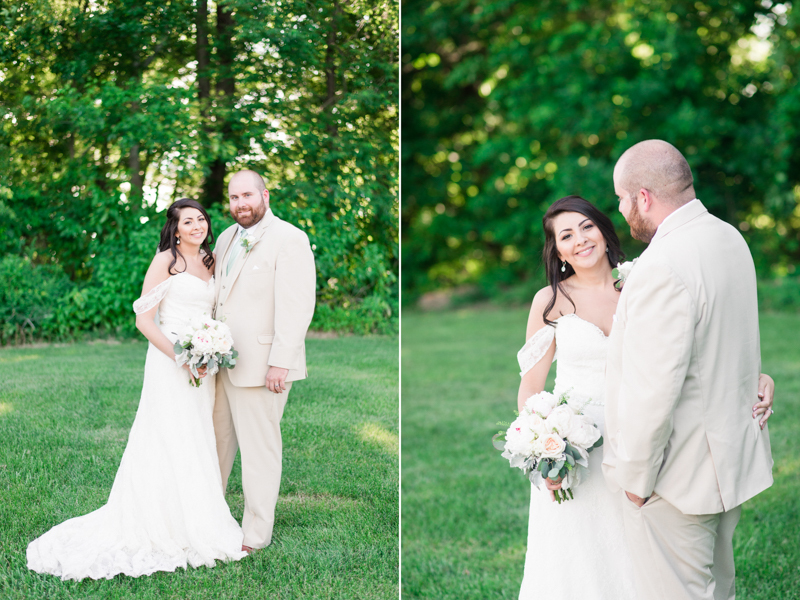 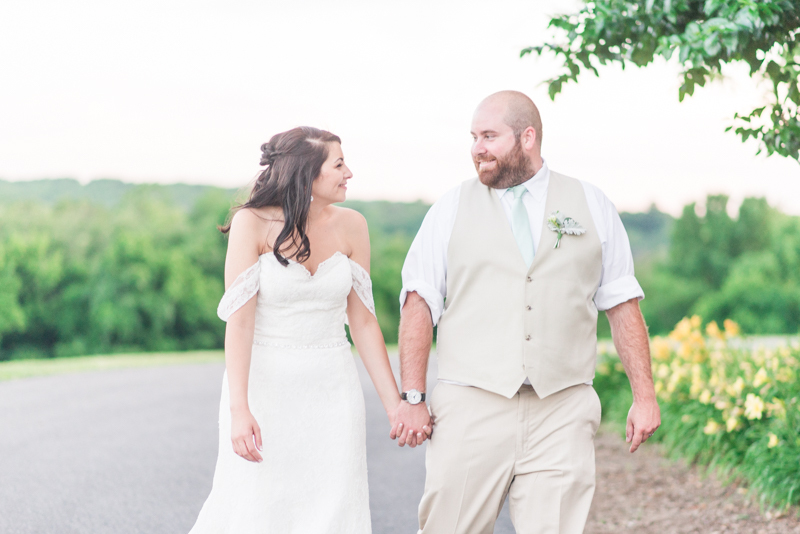 When Shawn and I pulled up to the Billingsley House in Upper Marlboro (the same location as Alexandra and Sean's wedding last November), my mind was already going nuts with excitement. 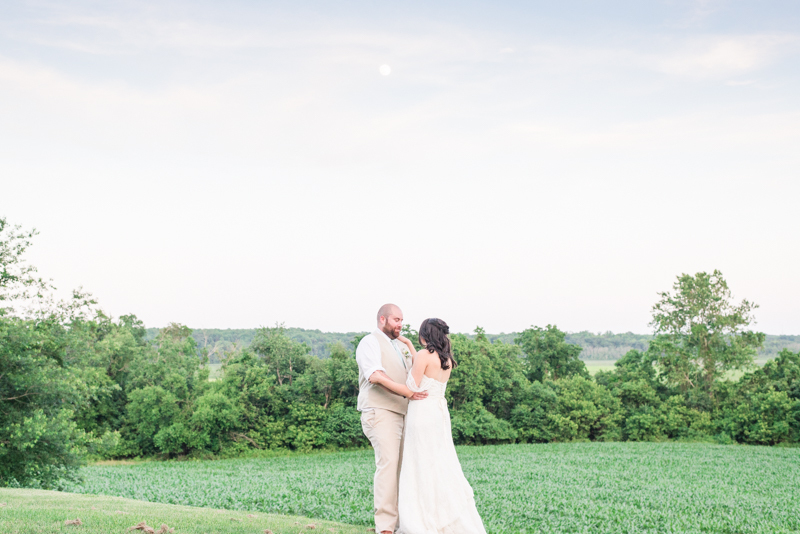 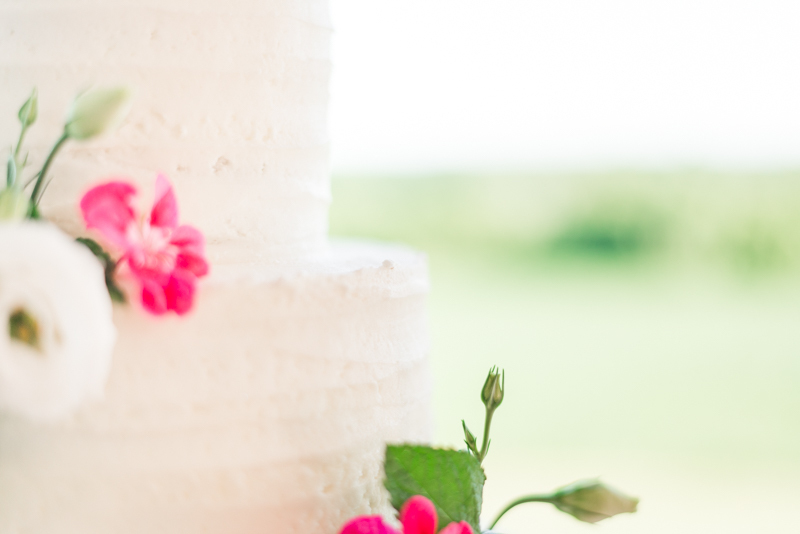 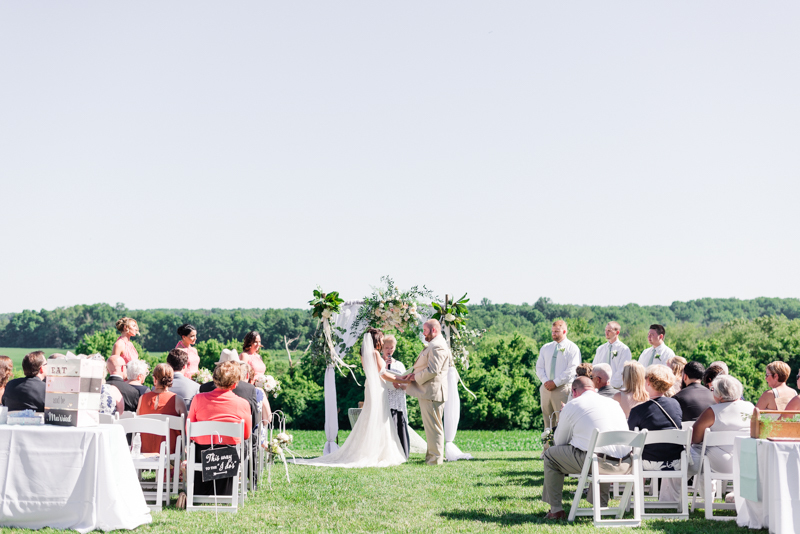 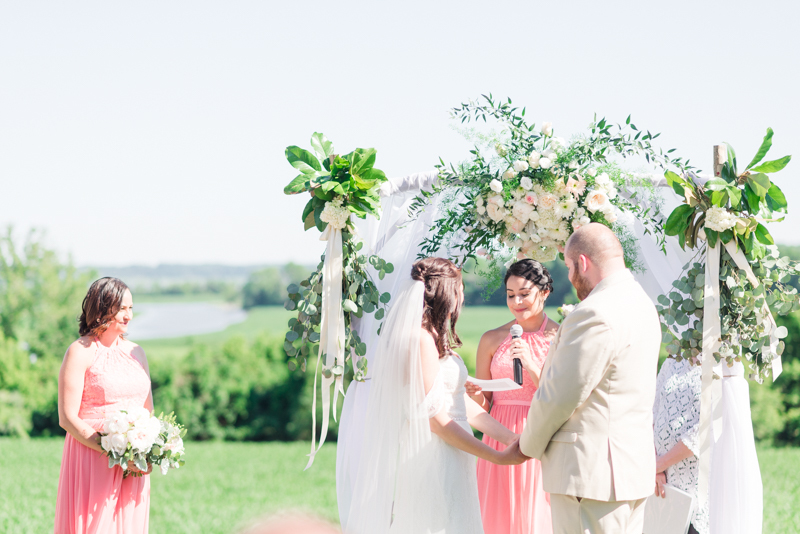 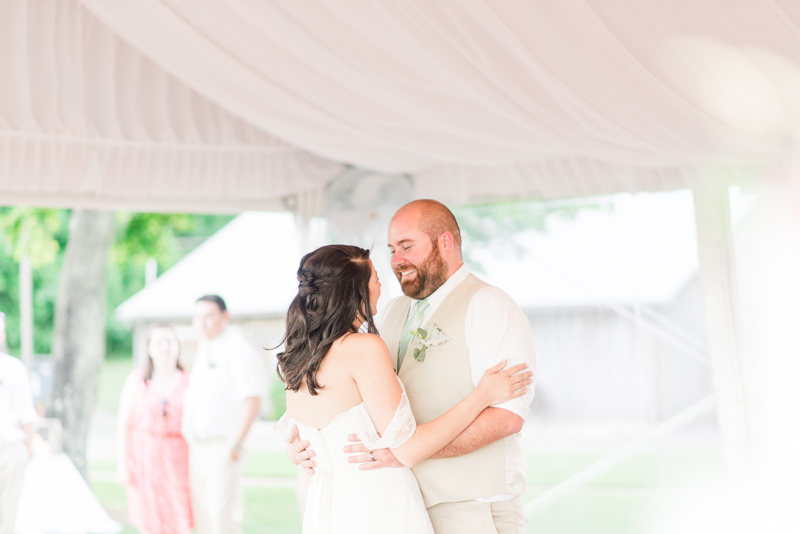 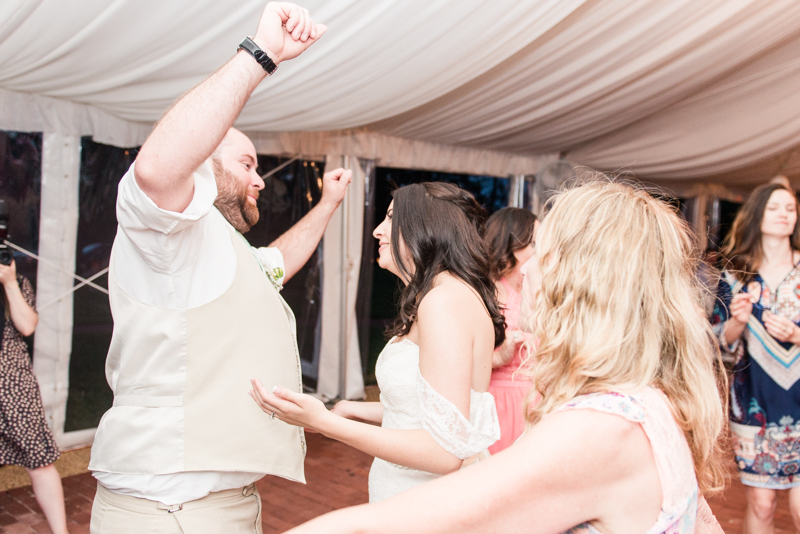 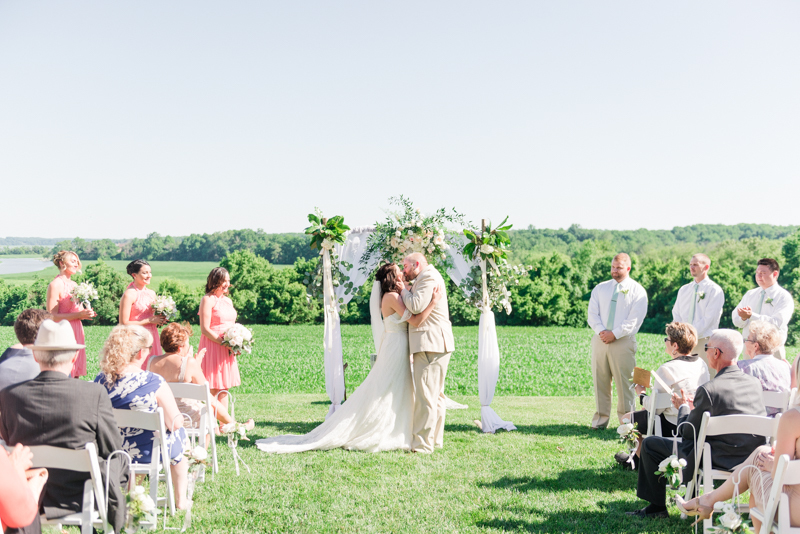 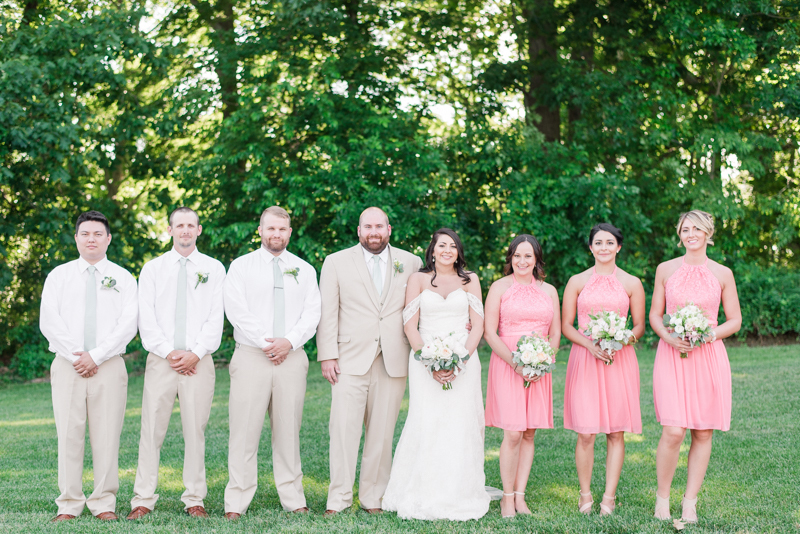 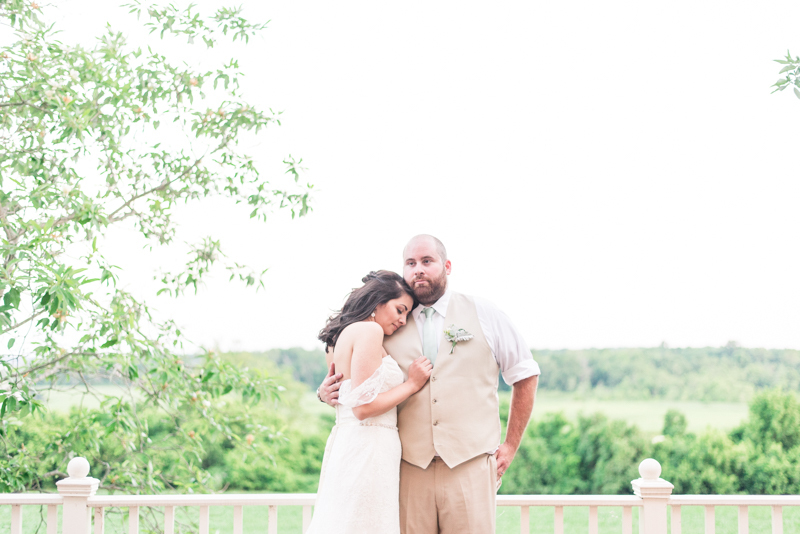 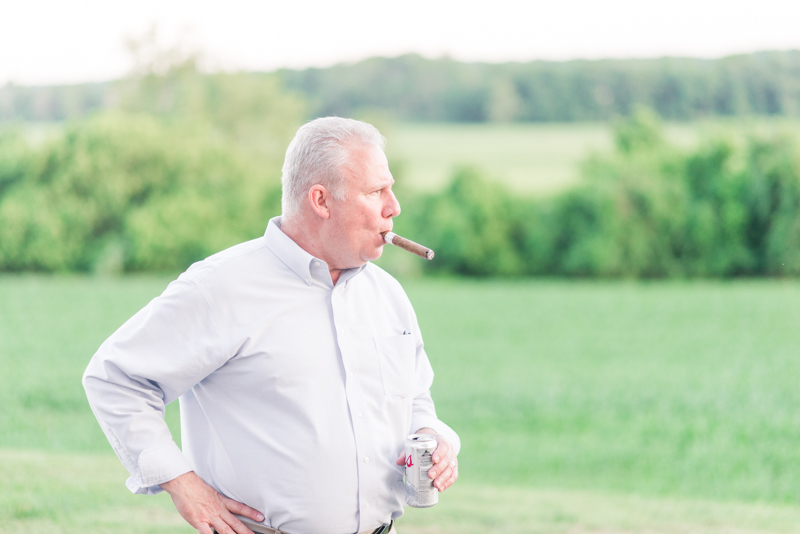 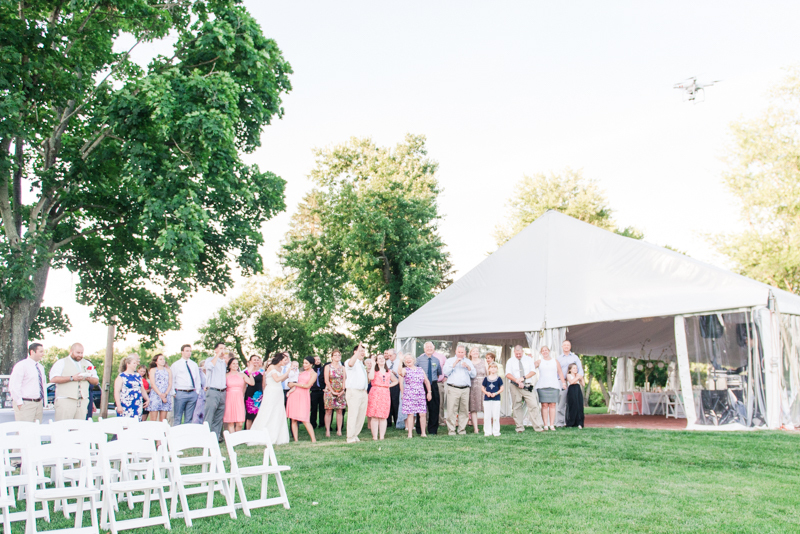 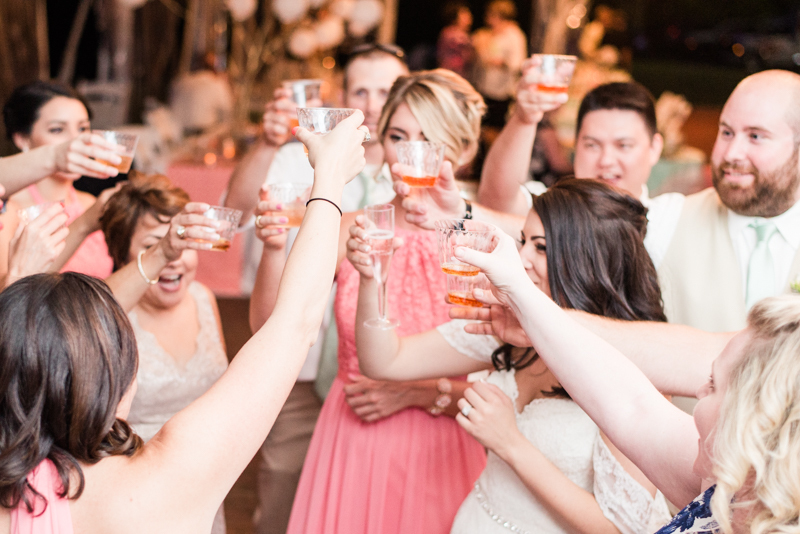 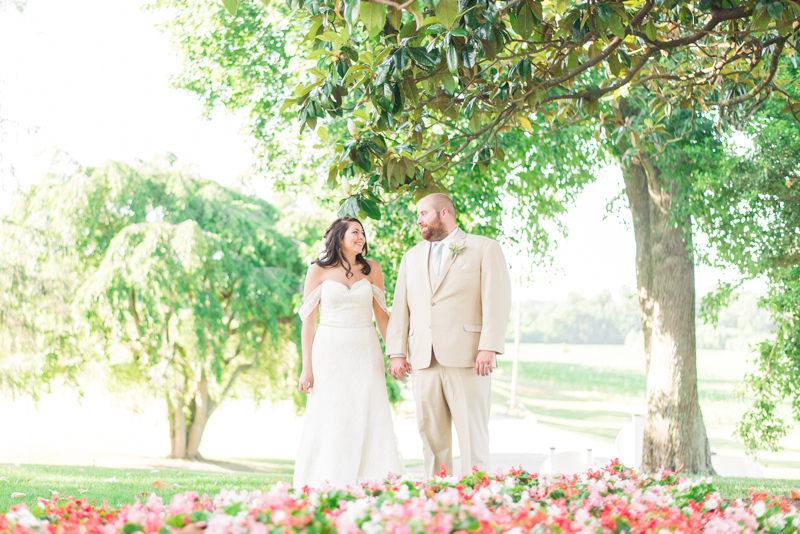 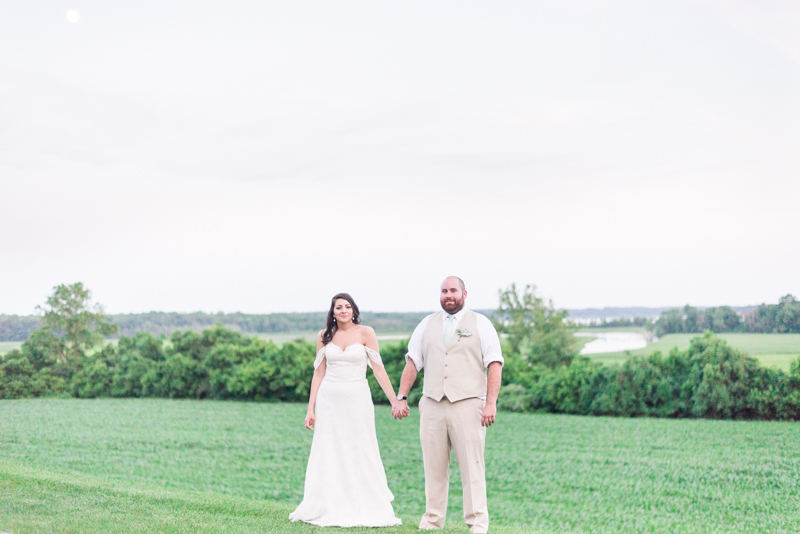 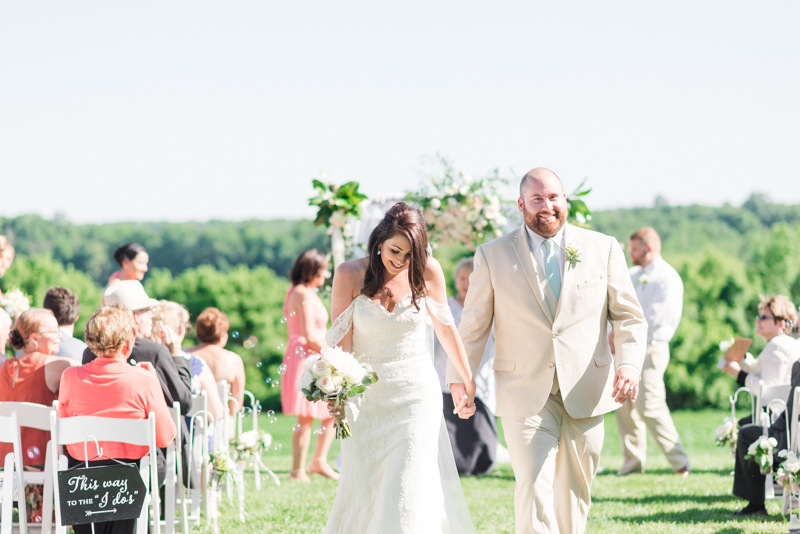 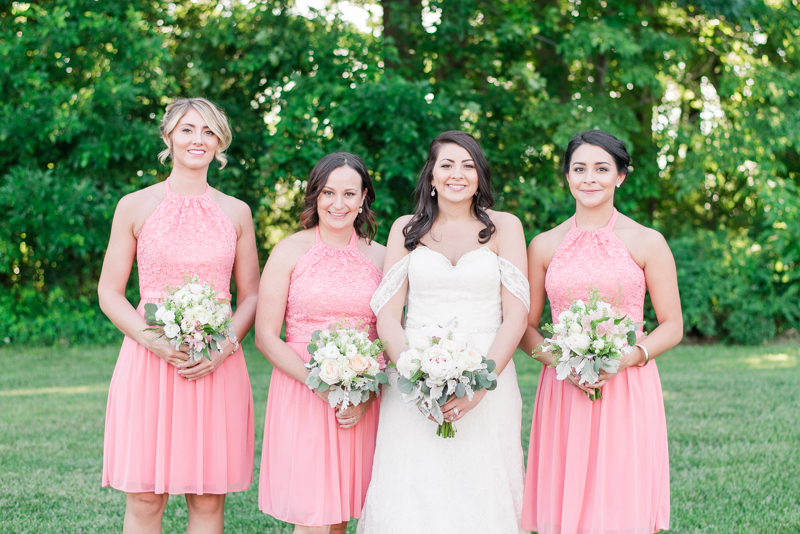 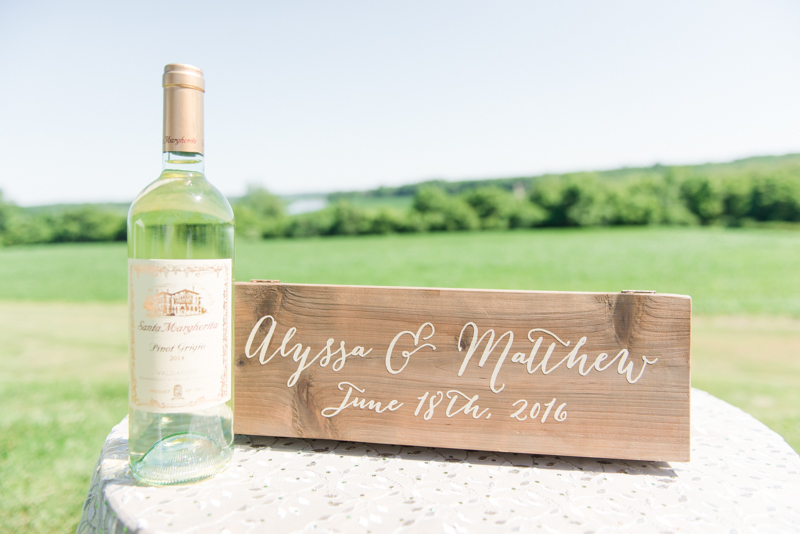 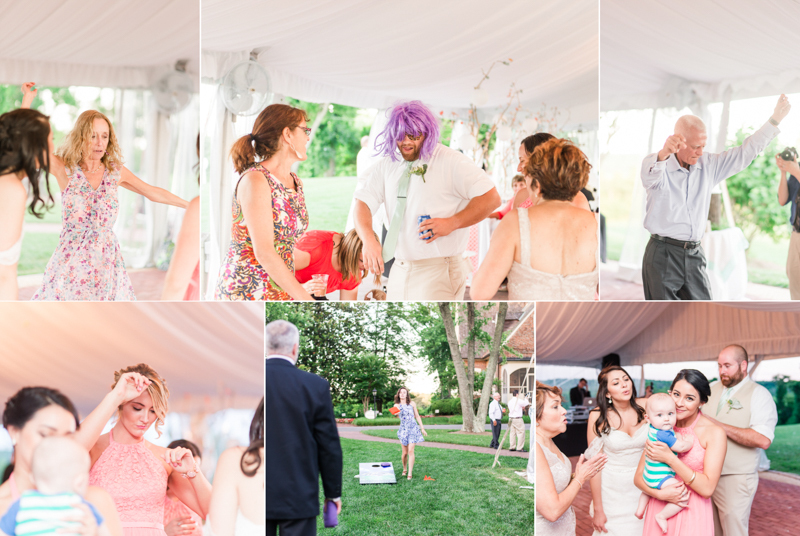 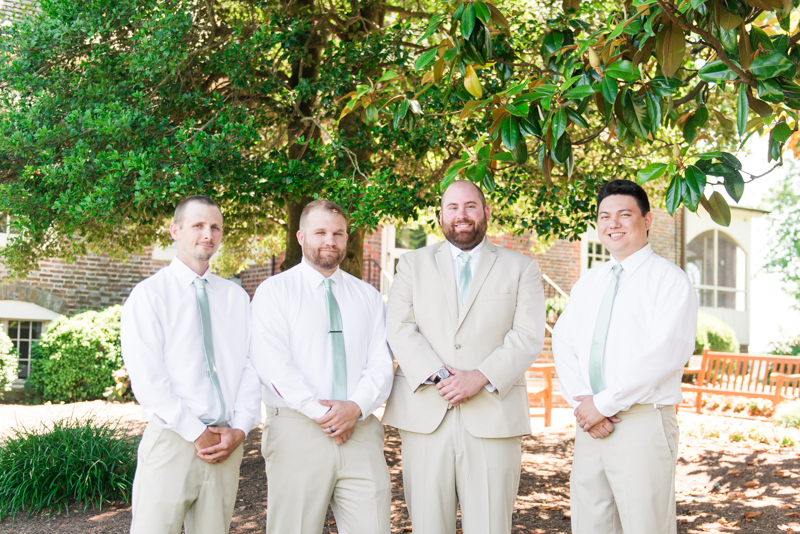 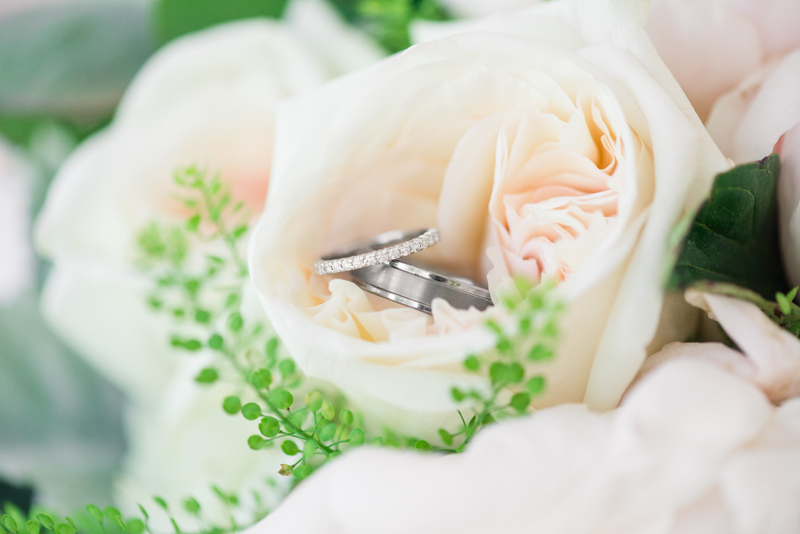 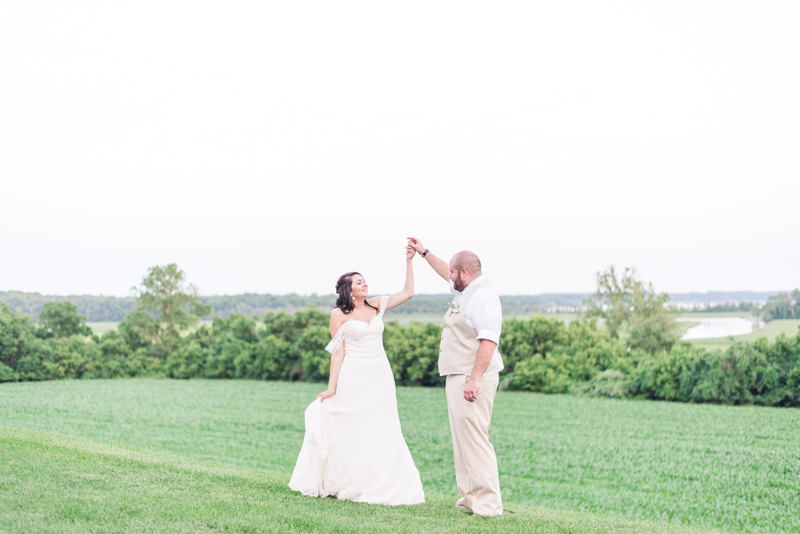 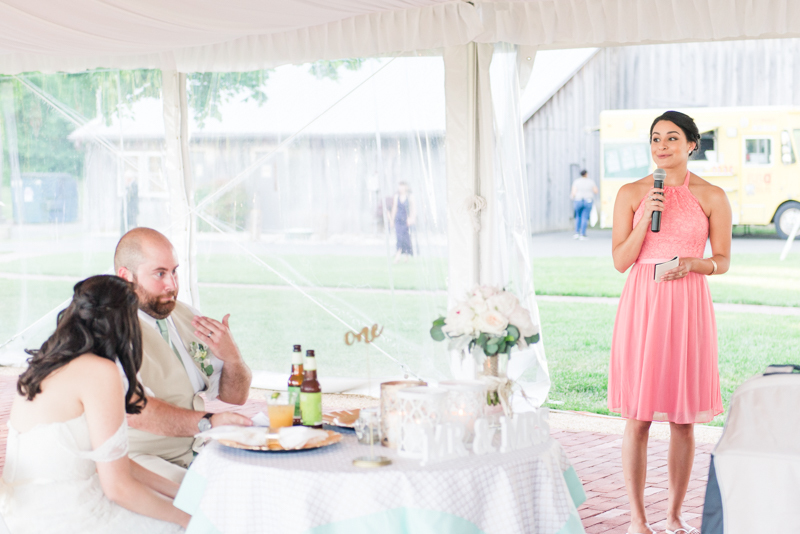 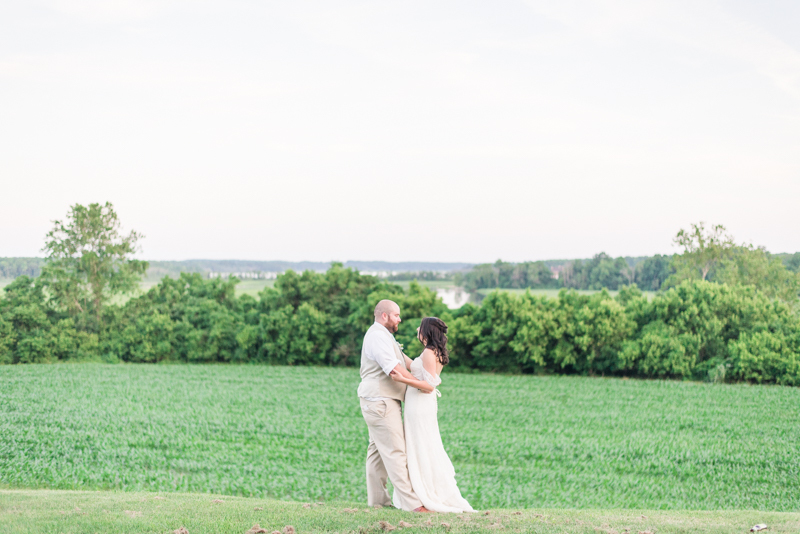 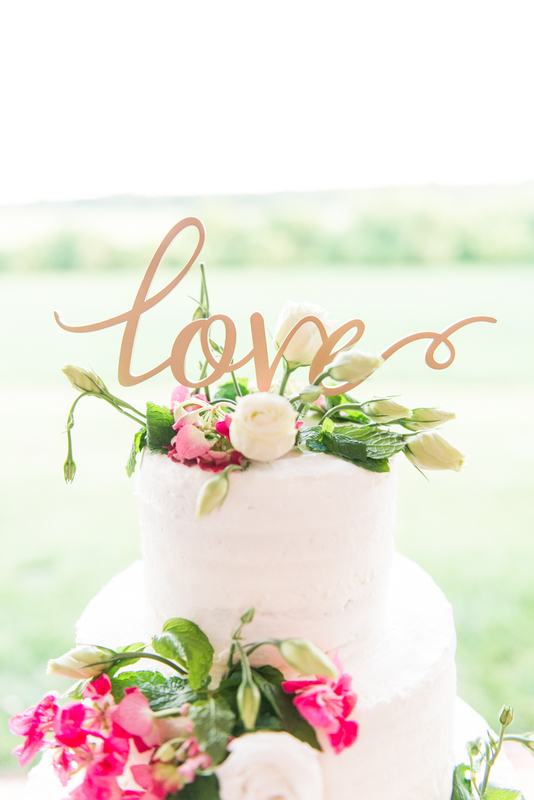 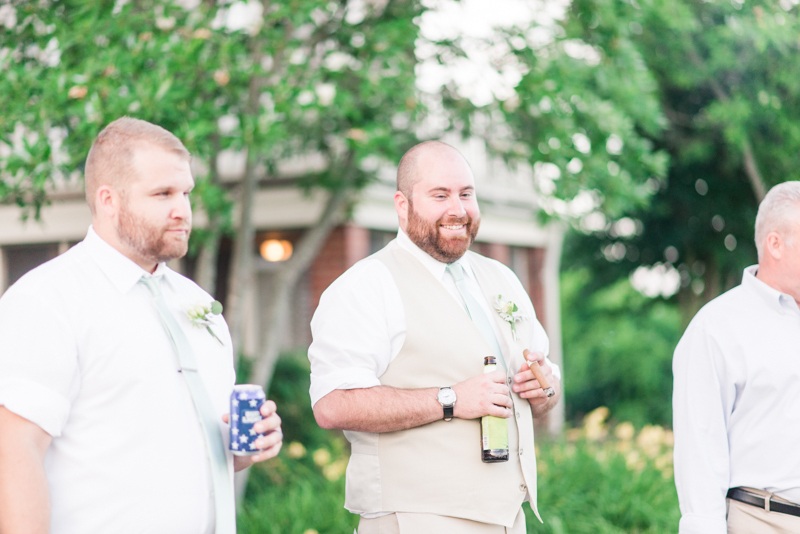 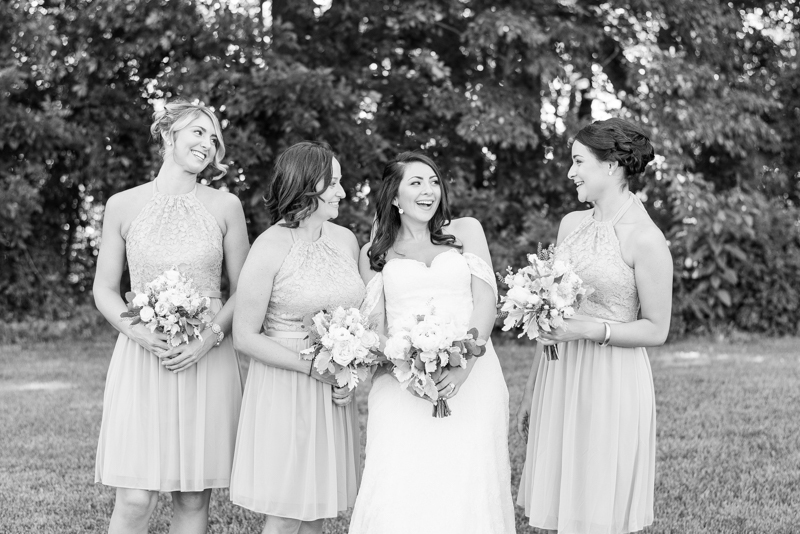 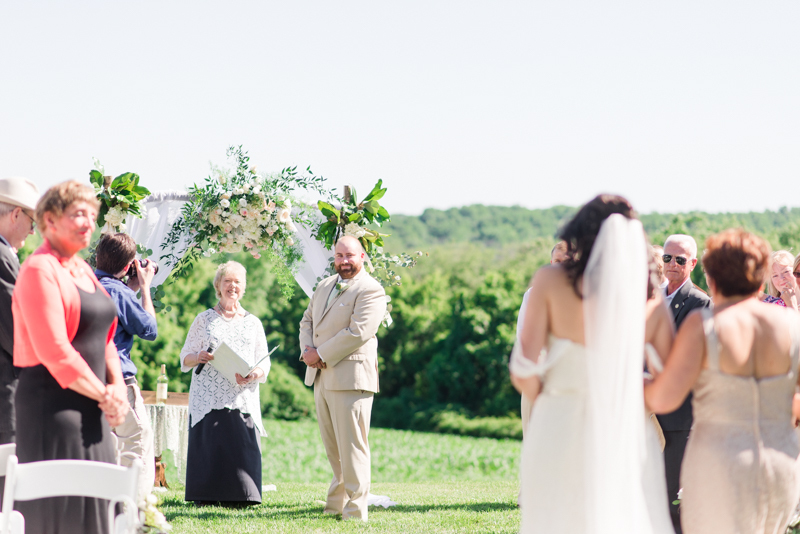 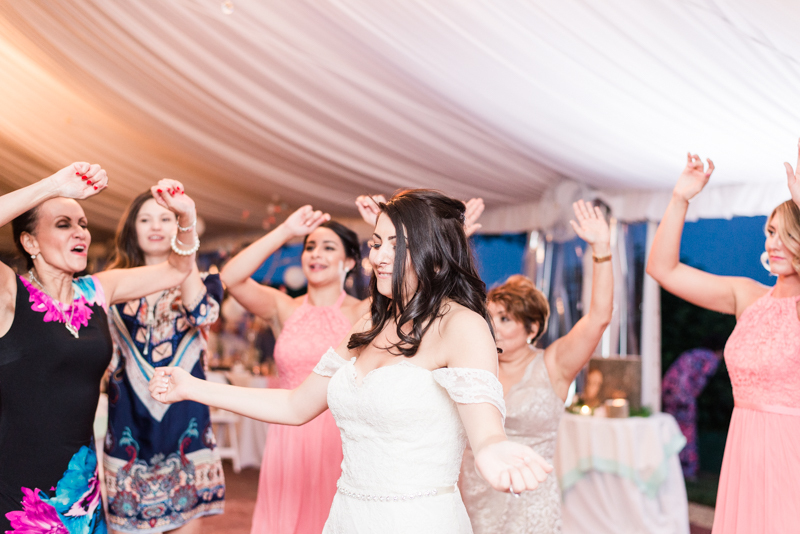 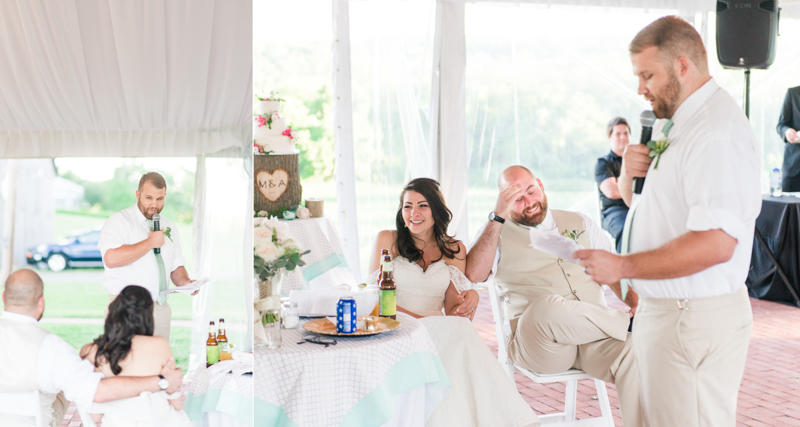 This venue is one of a kind, with beautiful views of the Patuxent and an excellent tented area, which gives any reception a very fancy but open feeling. 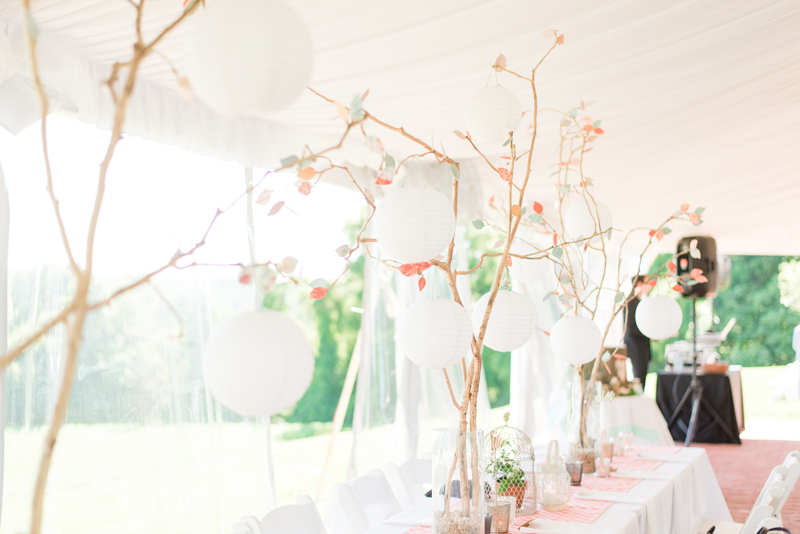 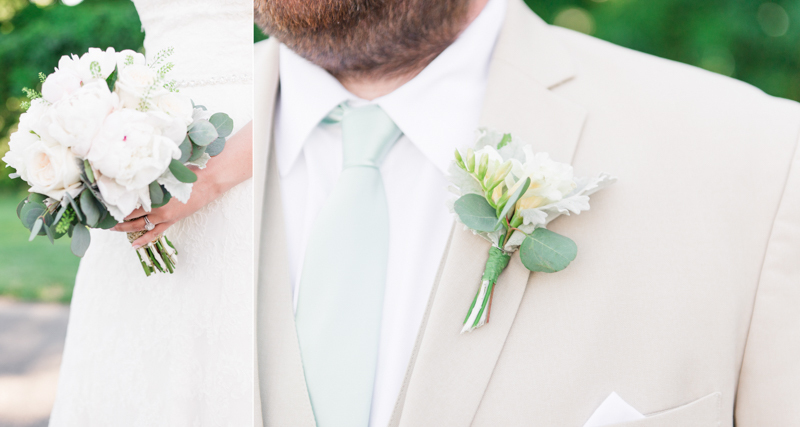 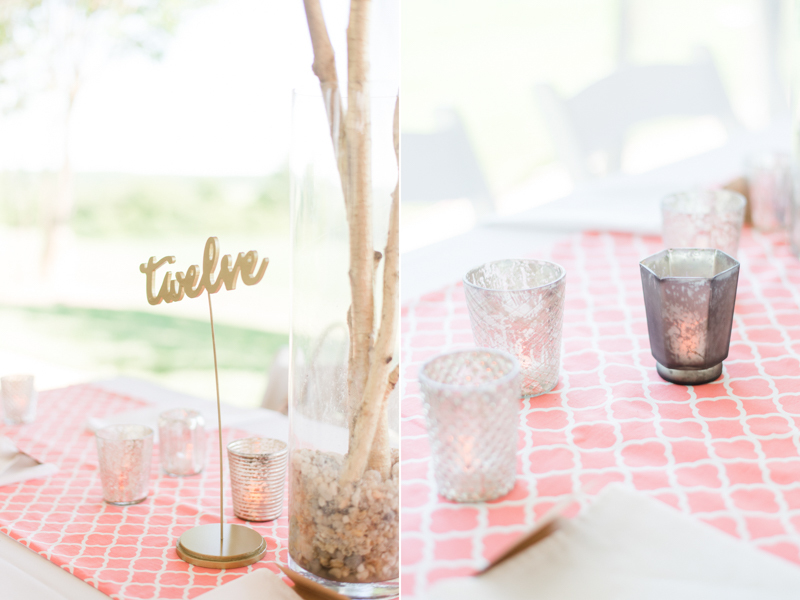 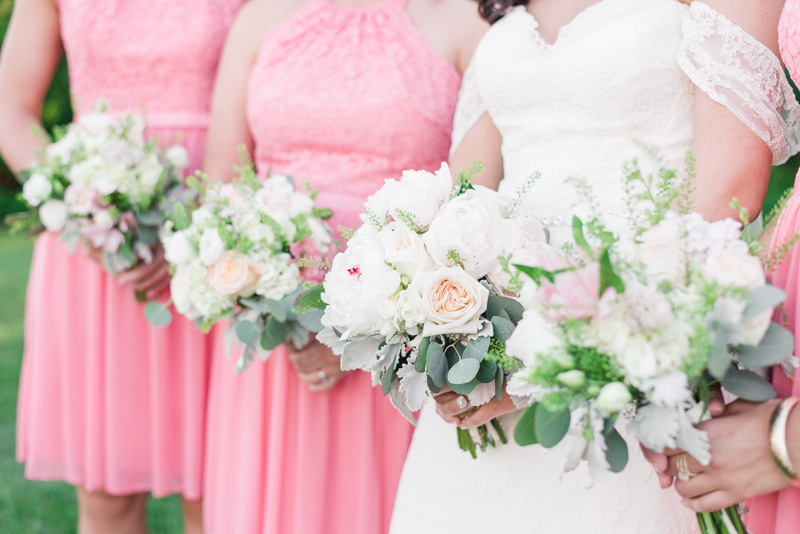 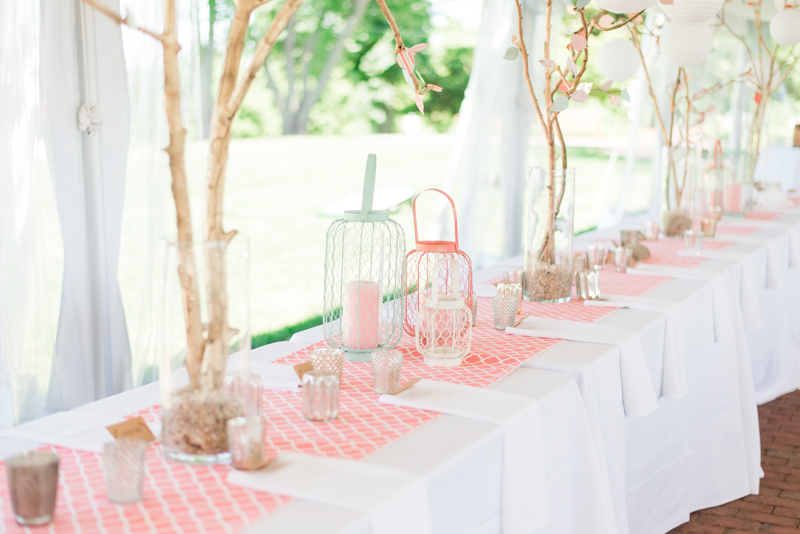 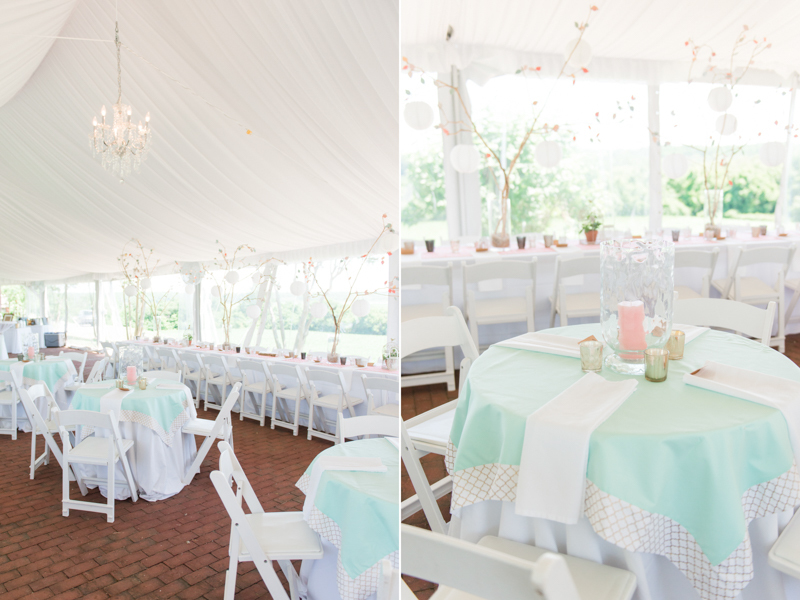 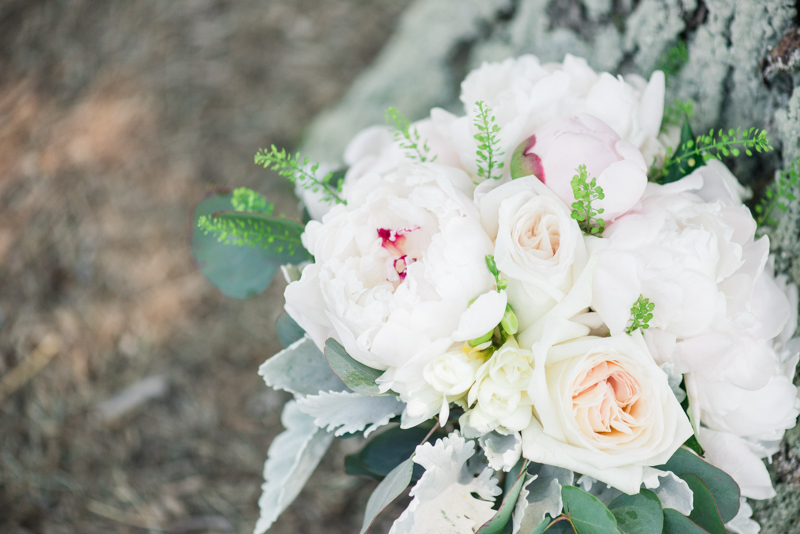 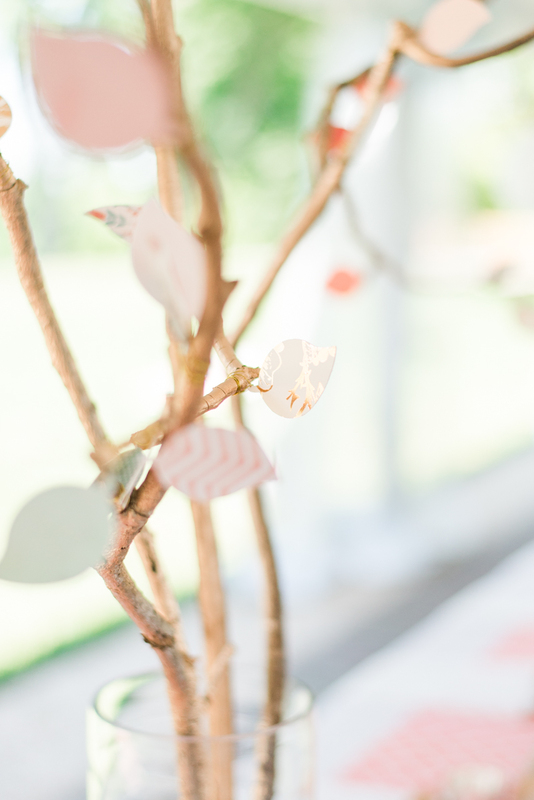 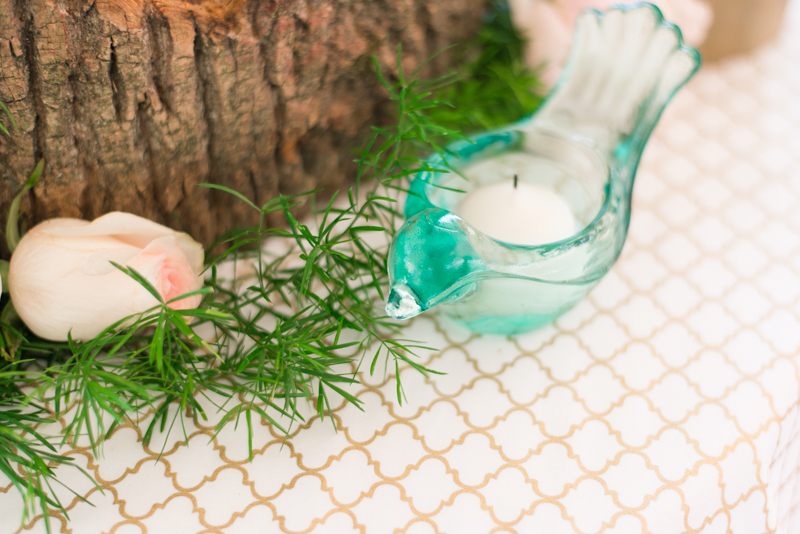 Driving up the tree lined drive-way, we could see the perfect pops of coral and mint, and we could also see the most interesting tree centerpieces on the colorful rectangular tables. 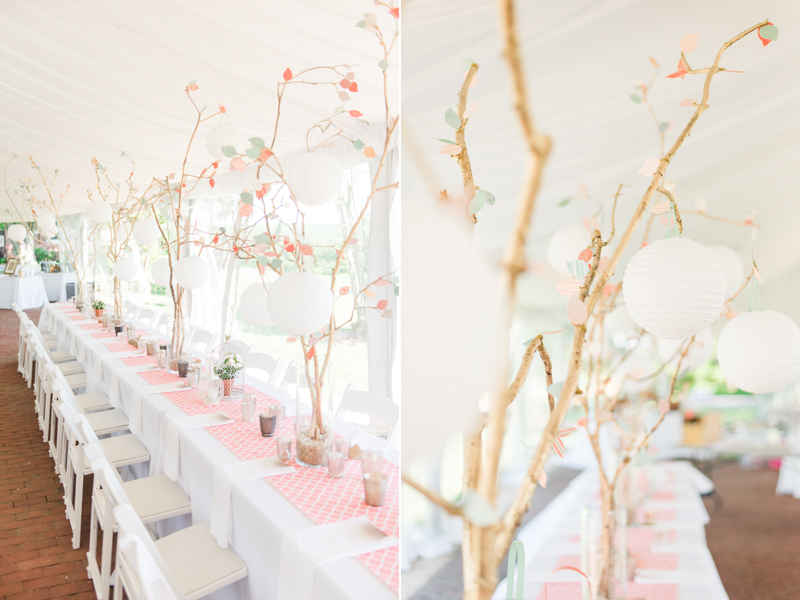 The tree branches and paper leaves added a dimension to the reception area that wouldn't have been achievable with just vases and flowers. 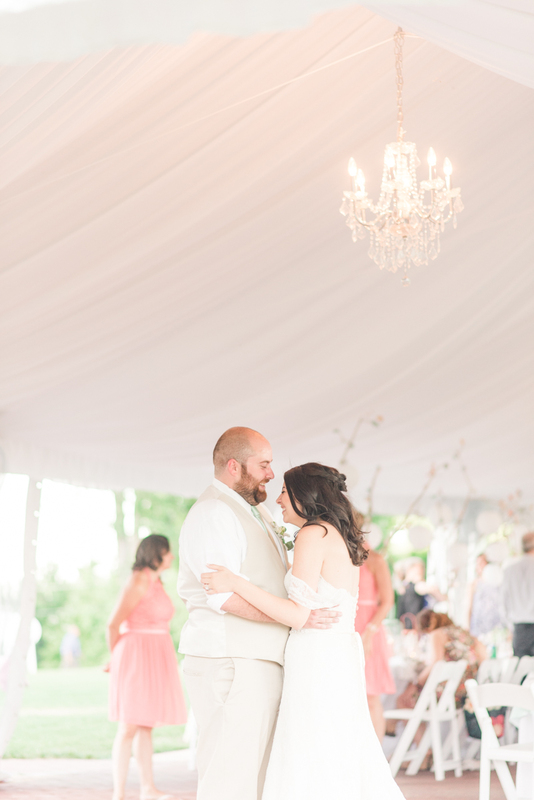 Immediately upon walking into the space, I was filled with a sense of overwhelming happiness thanks to all of the details that fit so perfectly together. 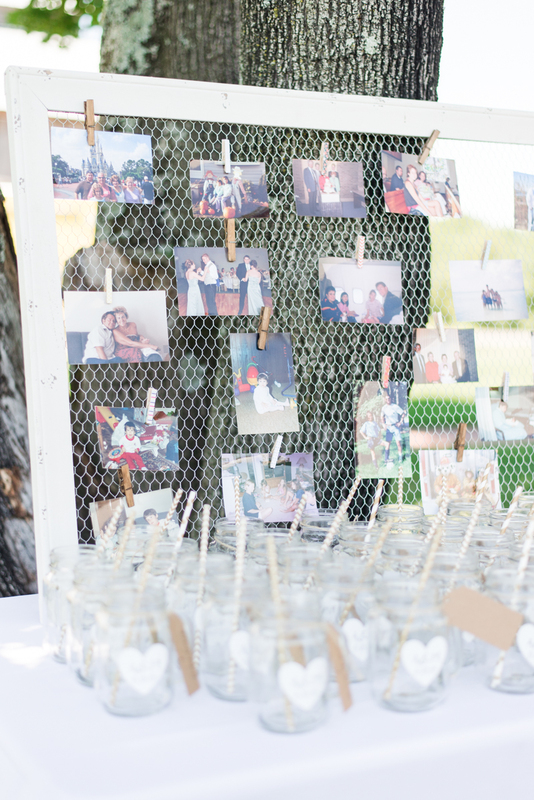 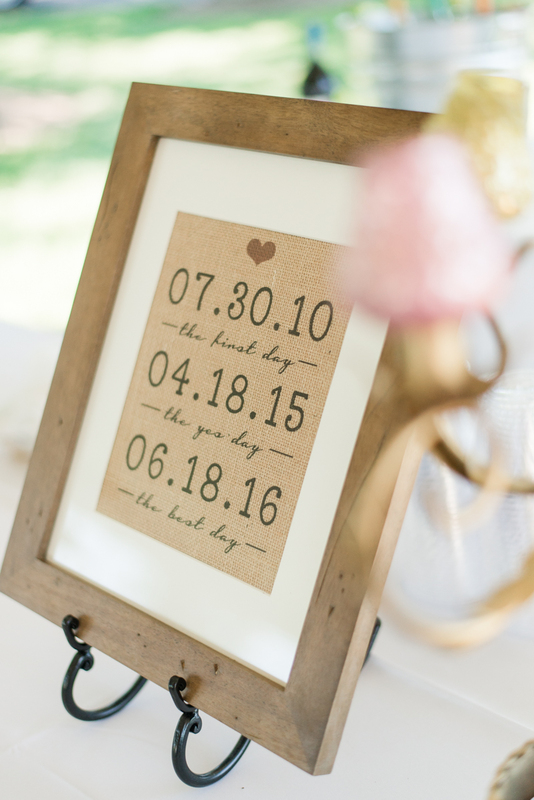 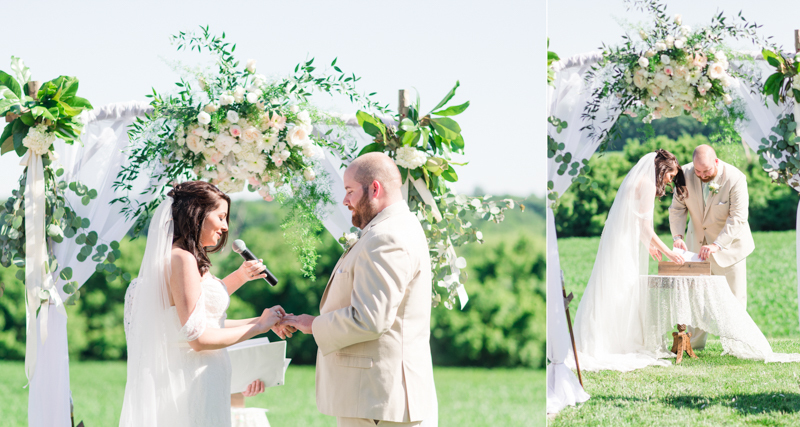 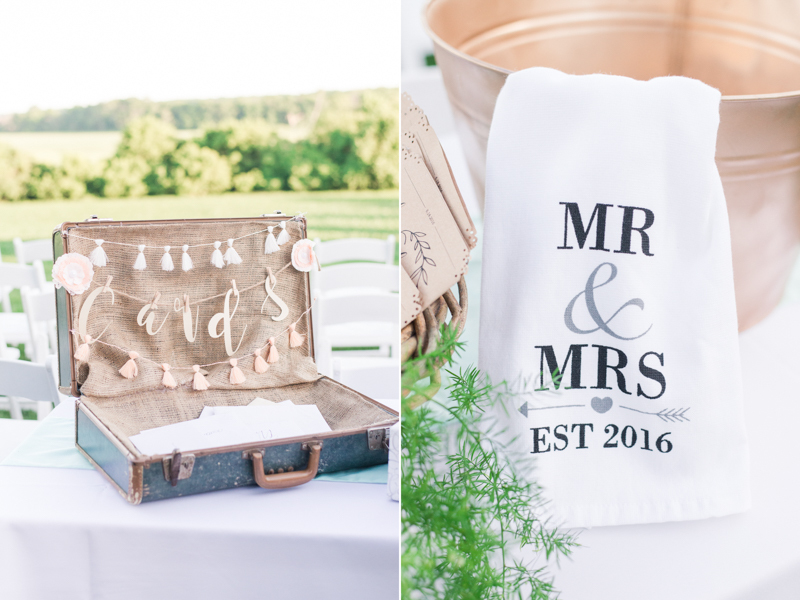 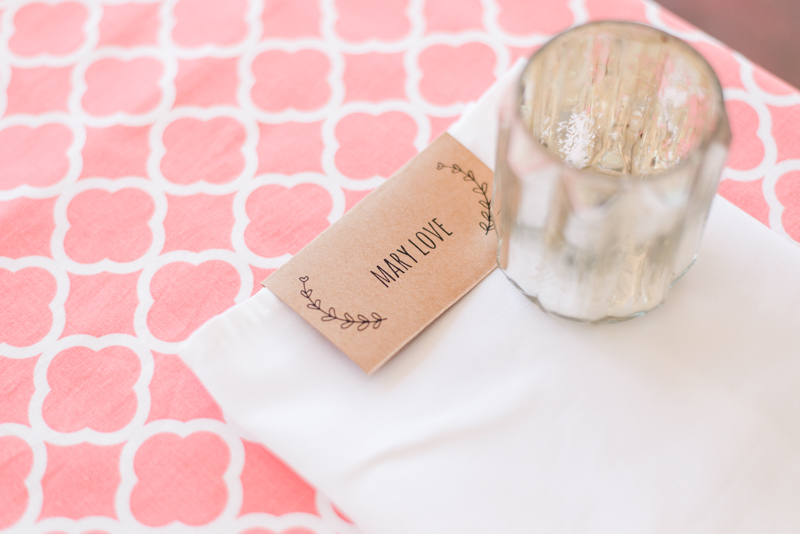 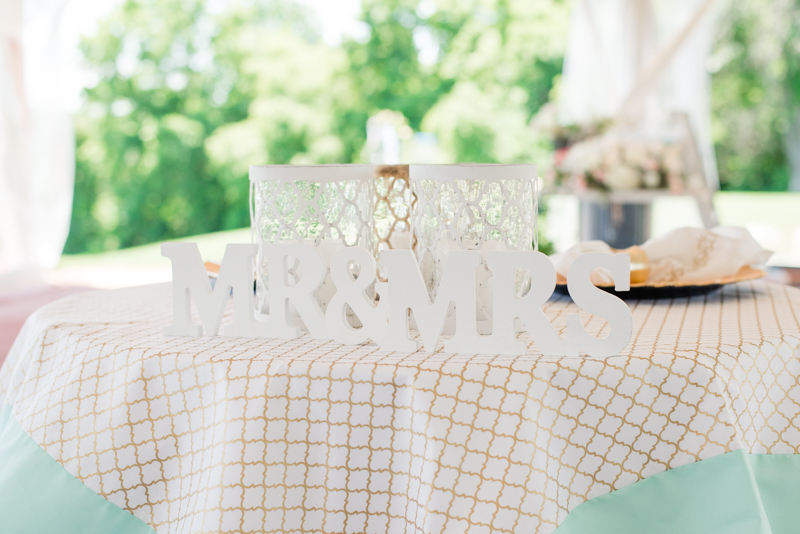 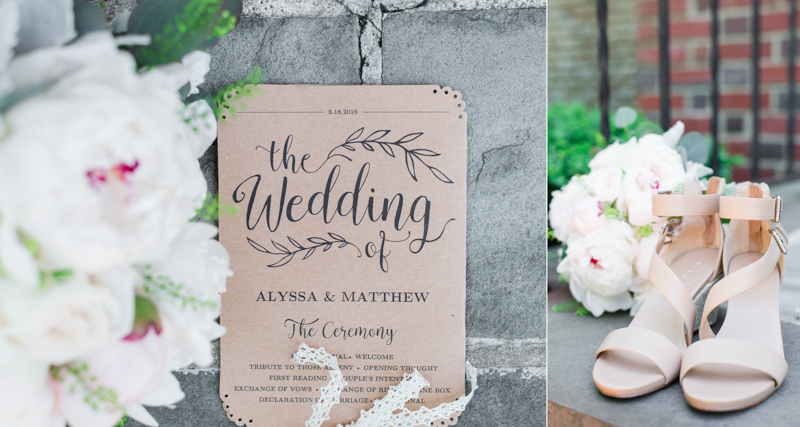 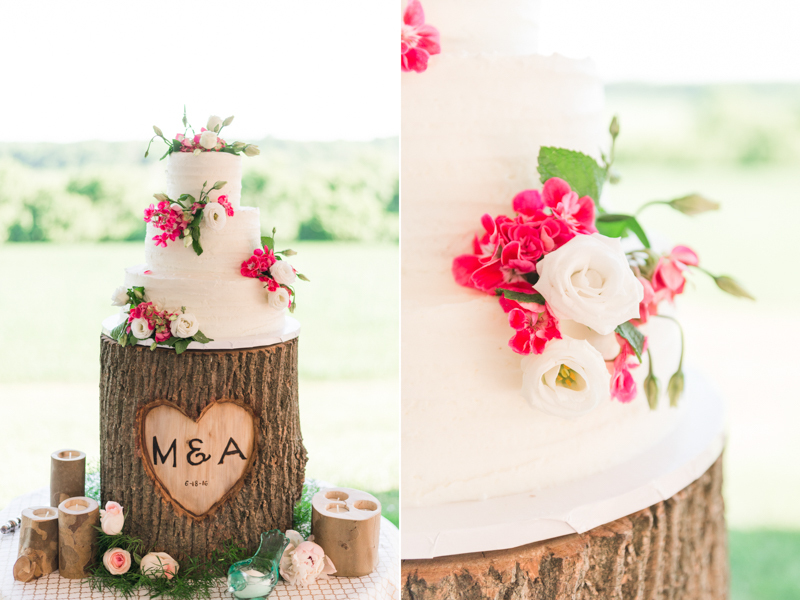 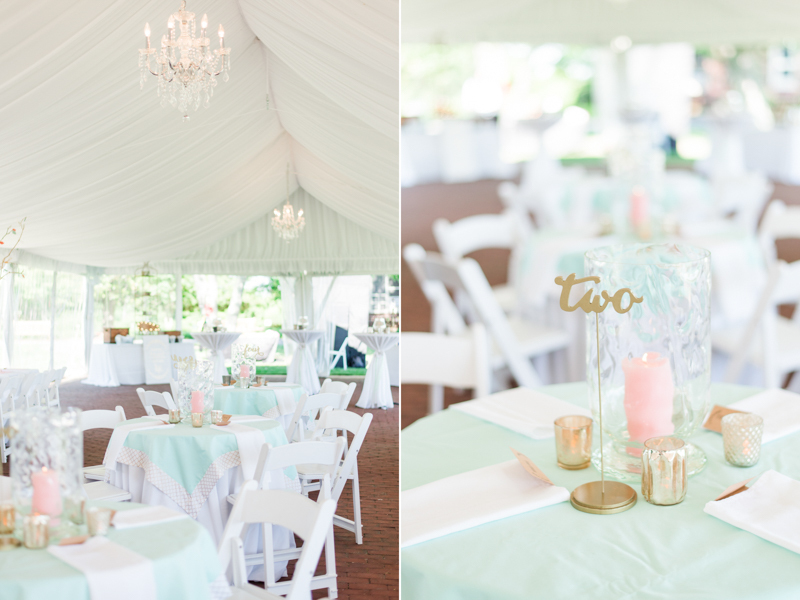 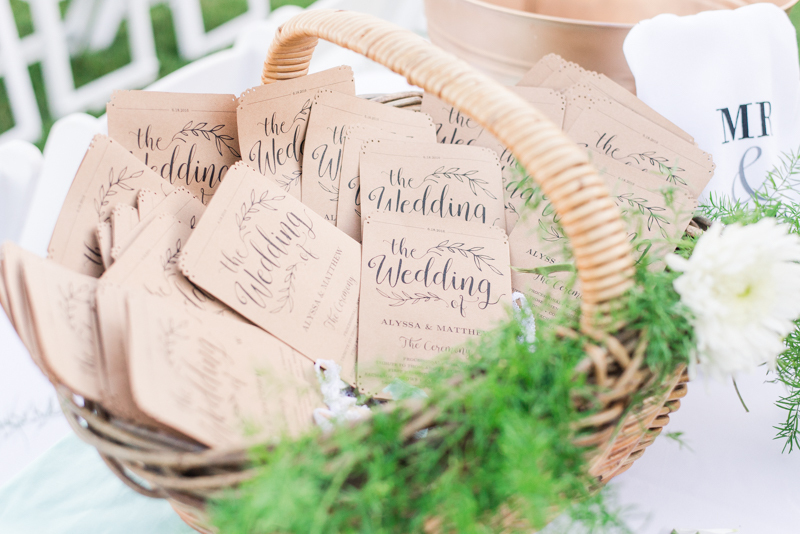 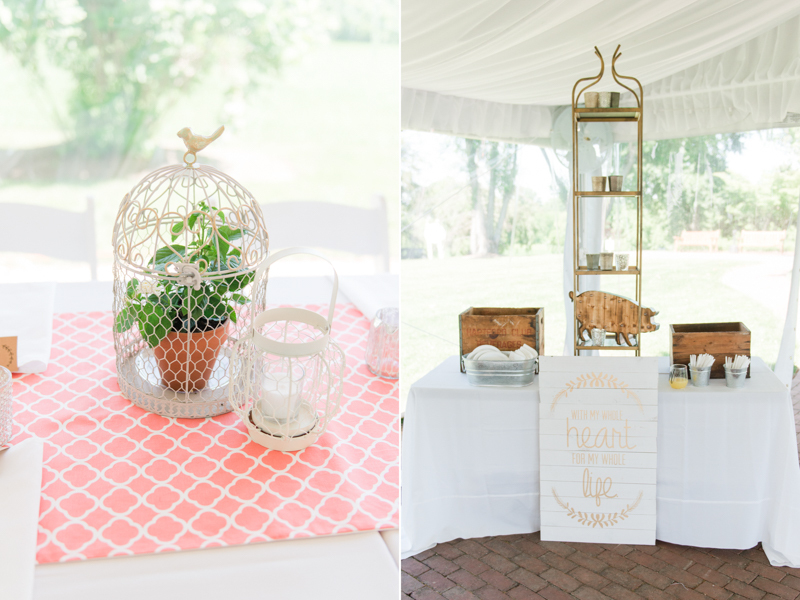 All of Alyssa and Matt's unique decor was from the mind of their wedding coordinator, Christina. 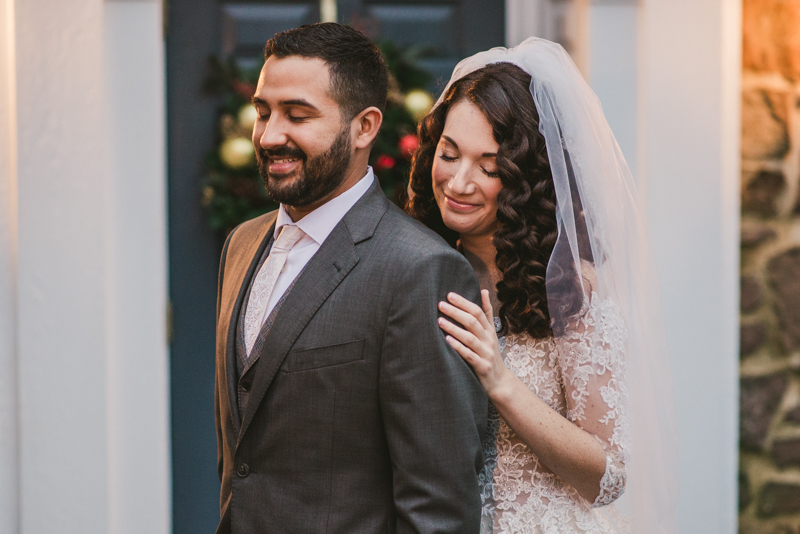 She put in so much time into every detail, and I was amazed at how she captured Alyssa and Matt's personalities in the decorations. 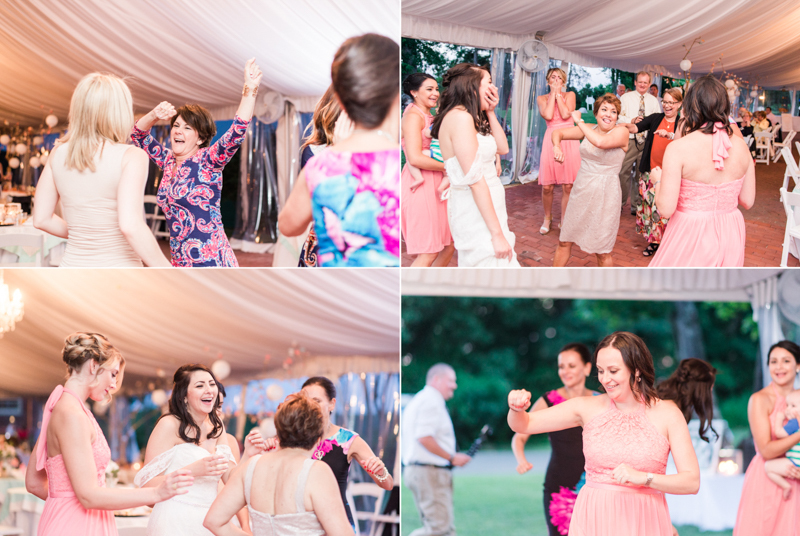 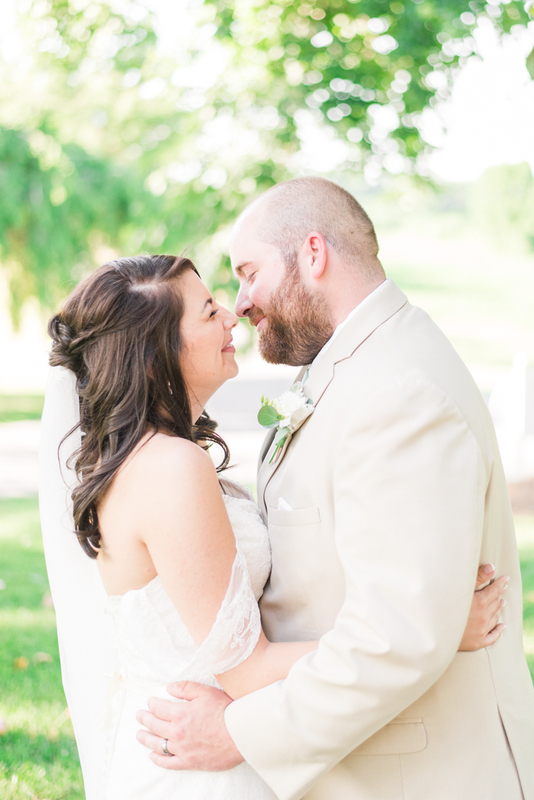 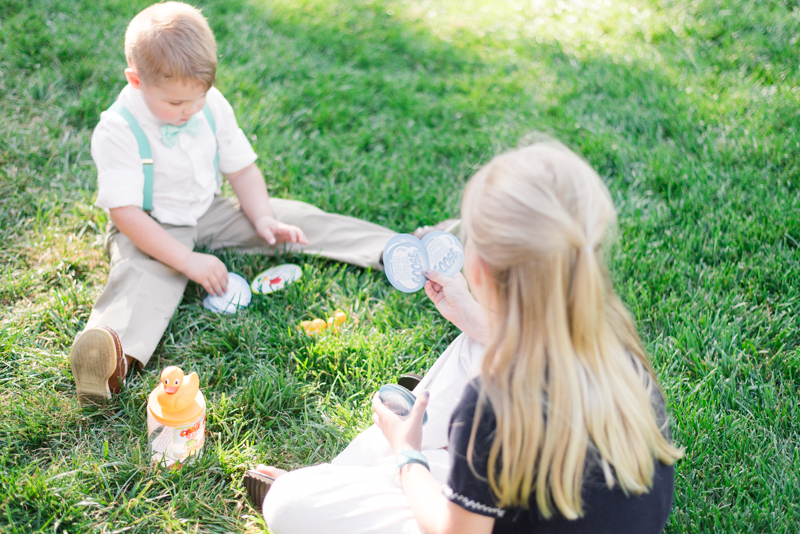 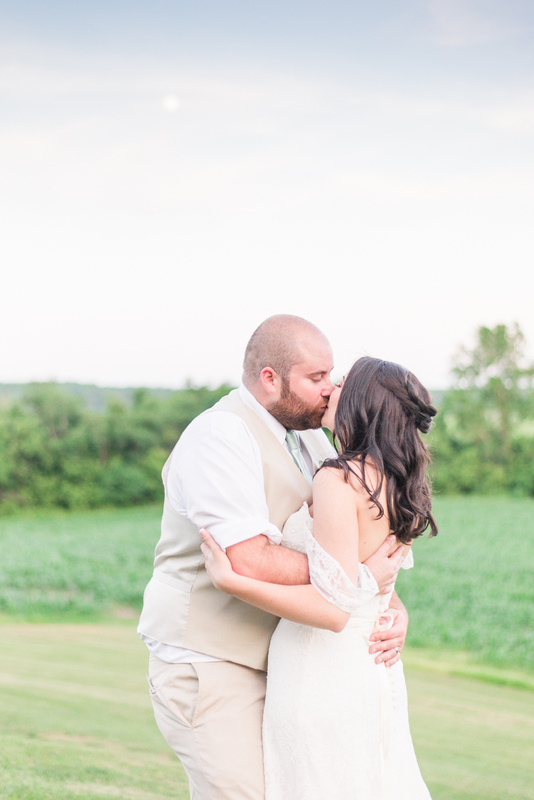 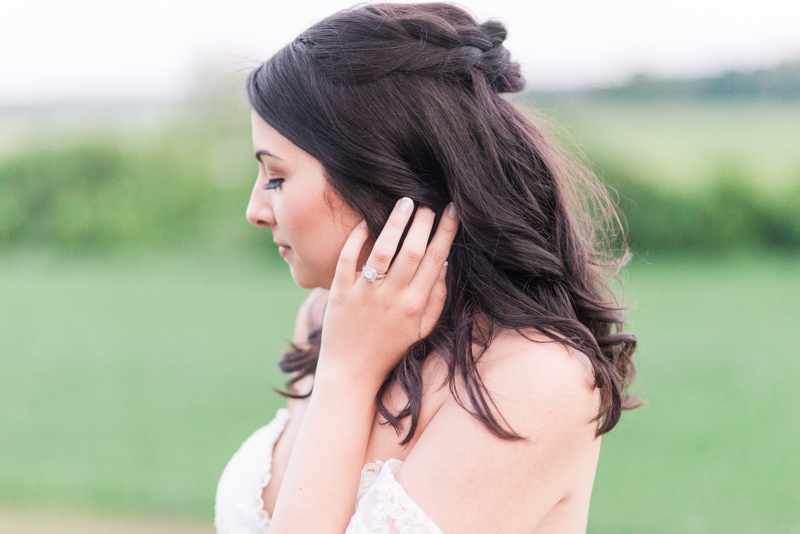 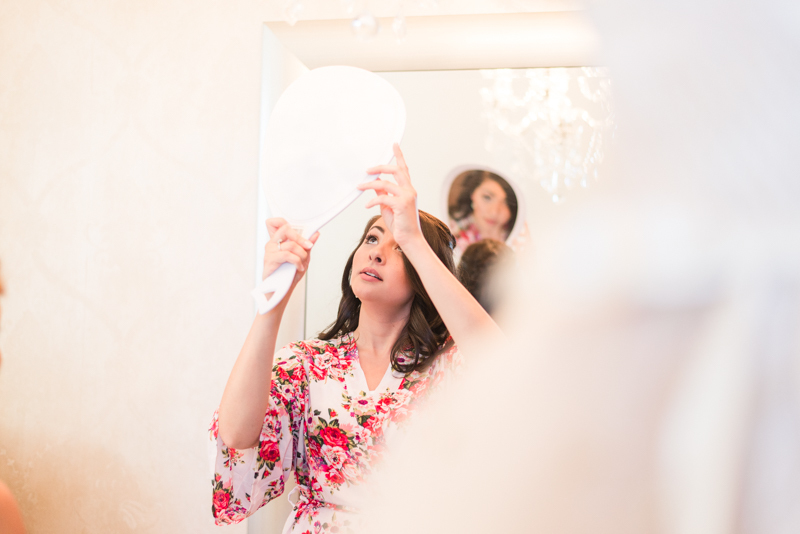 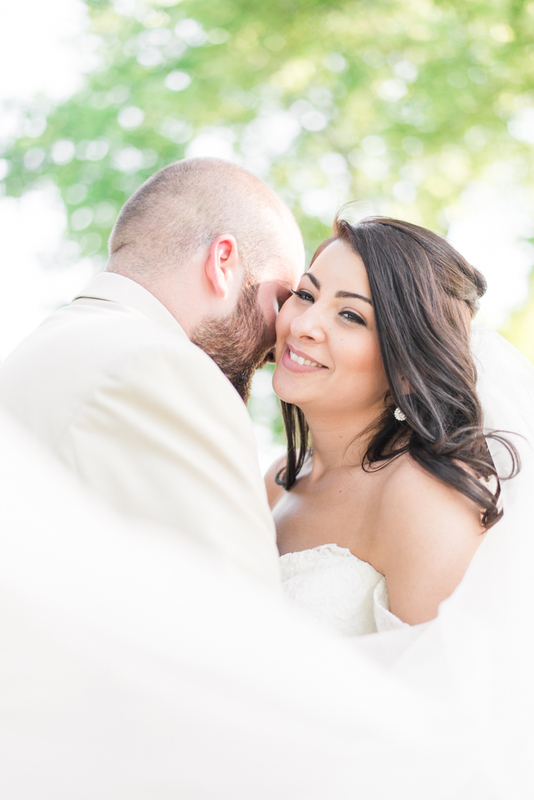 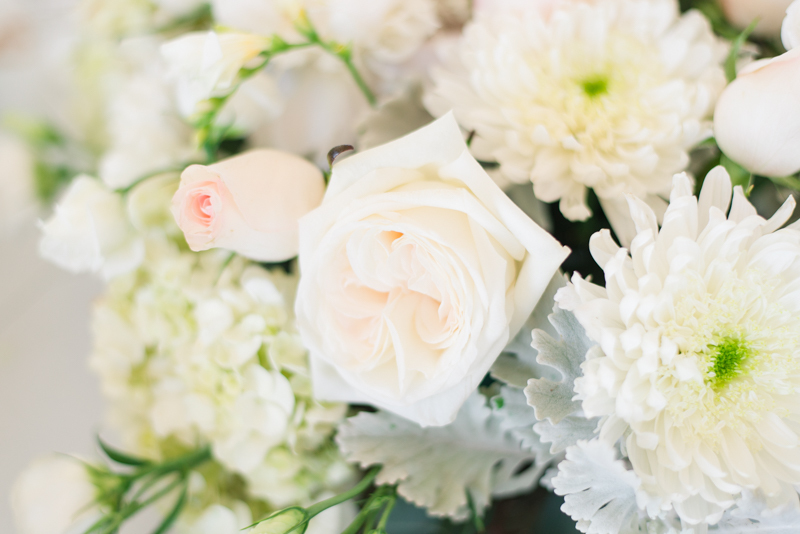 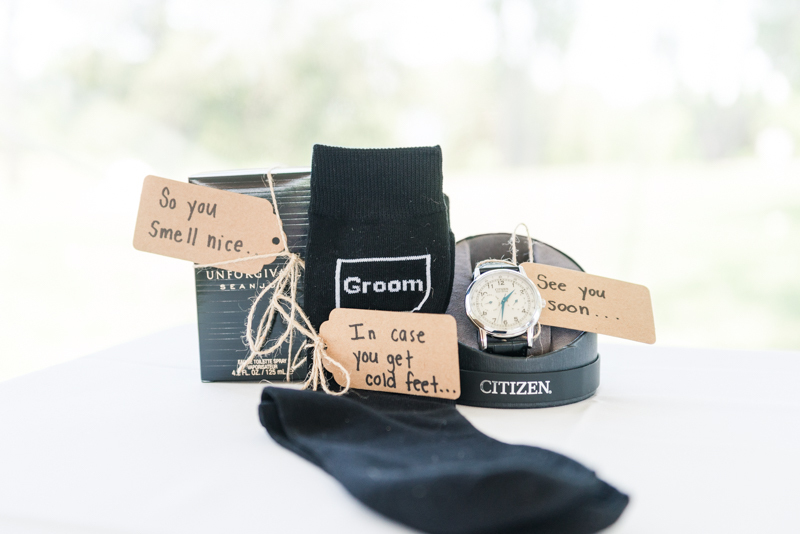 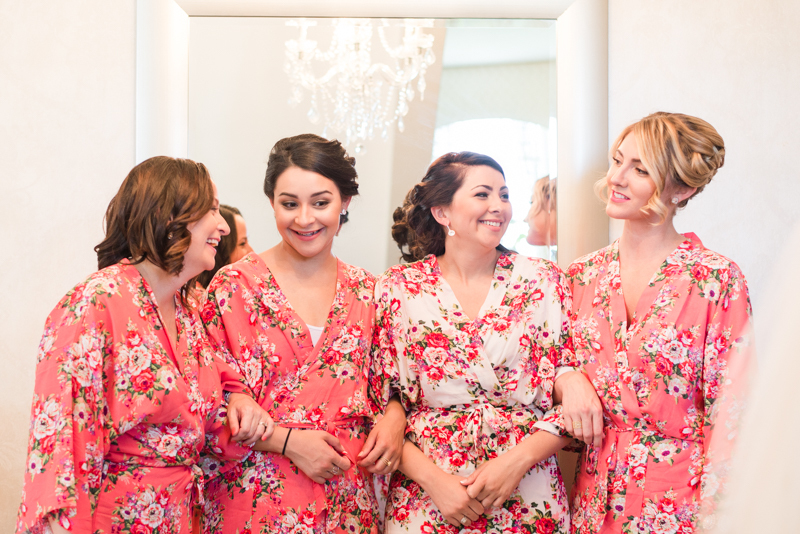 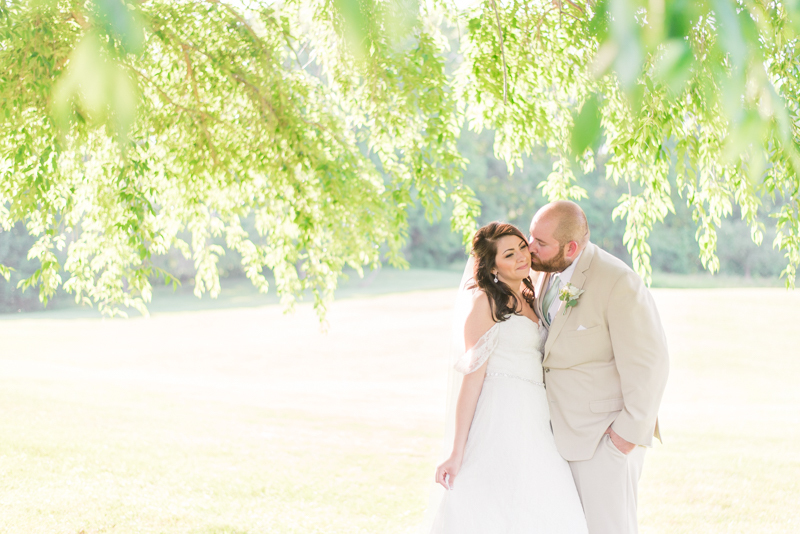 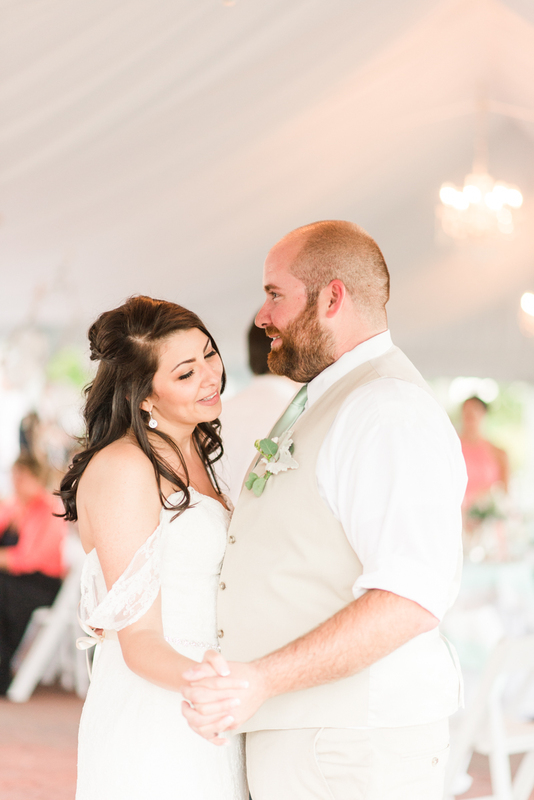 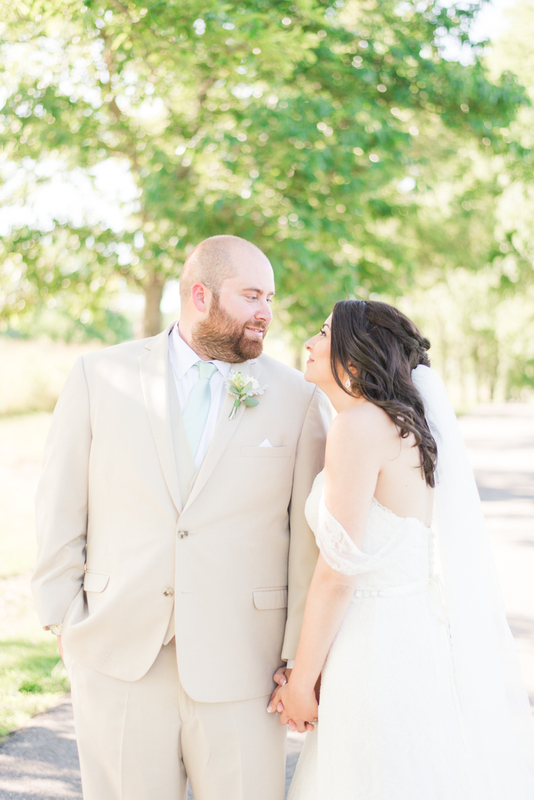 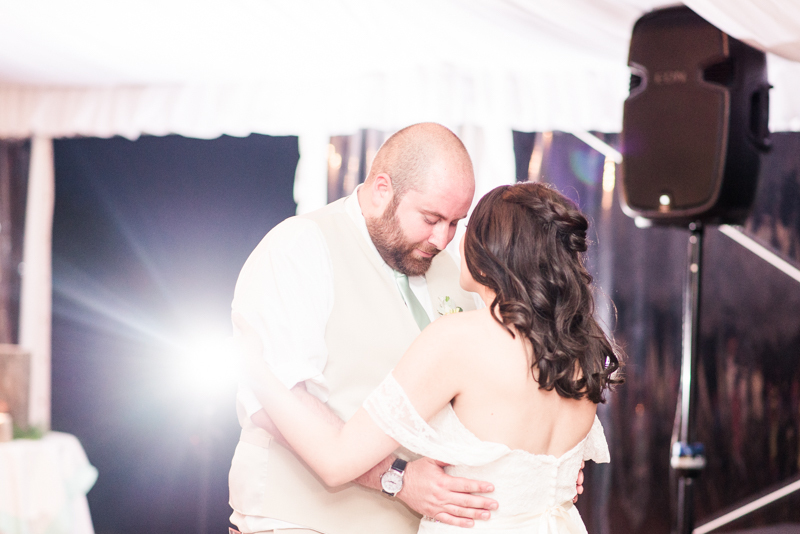 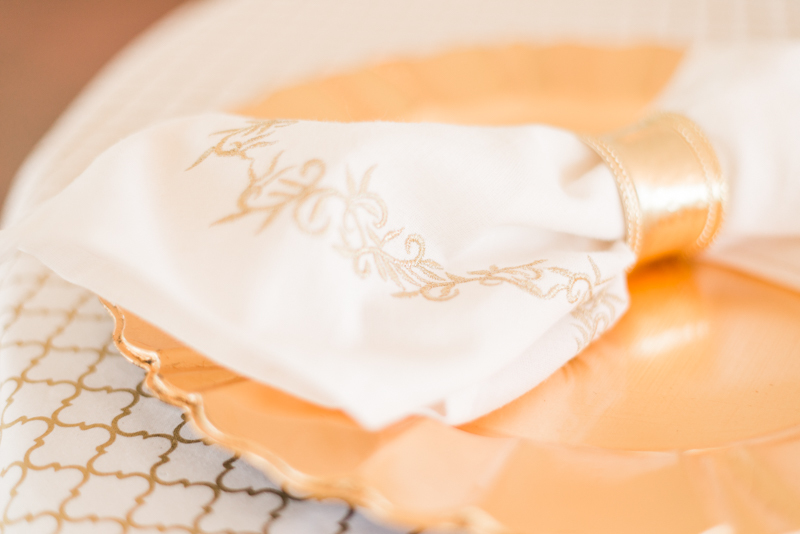 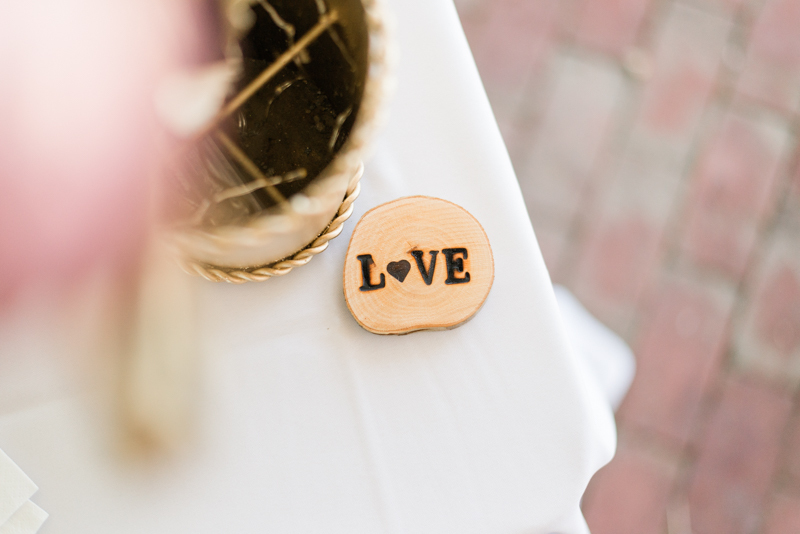 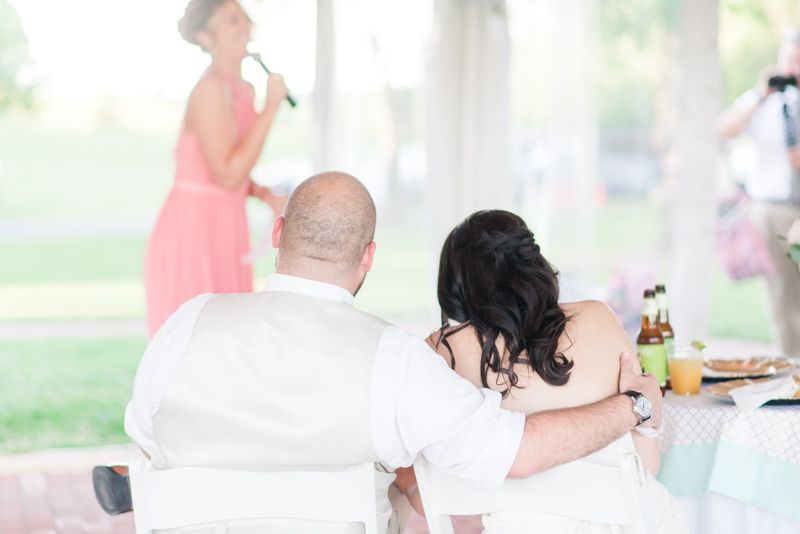 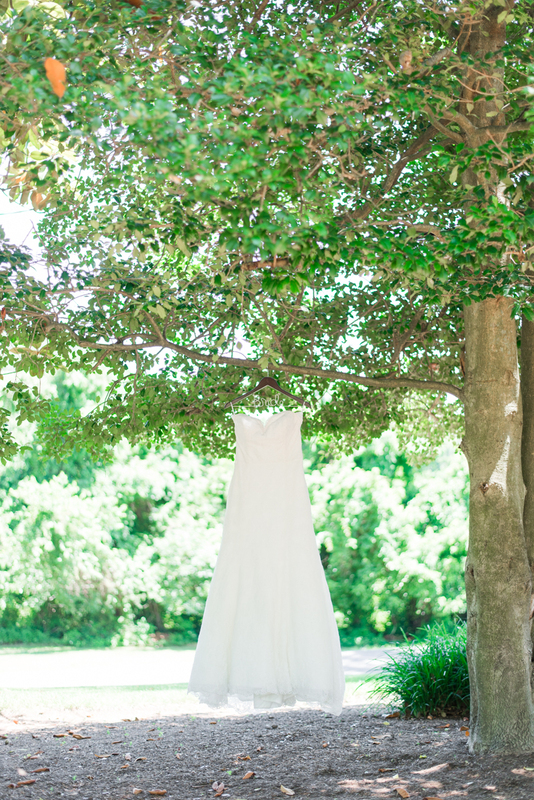 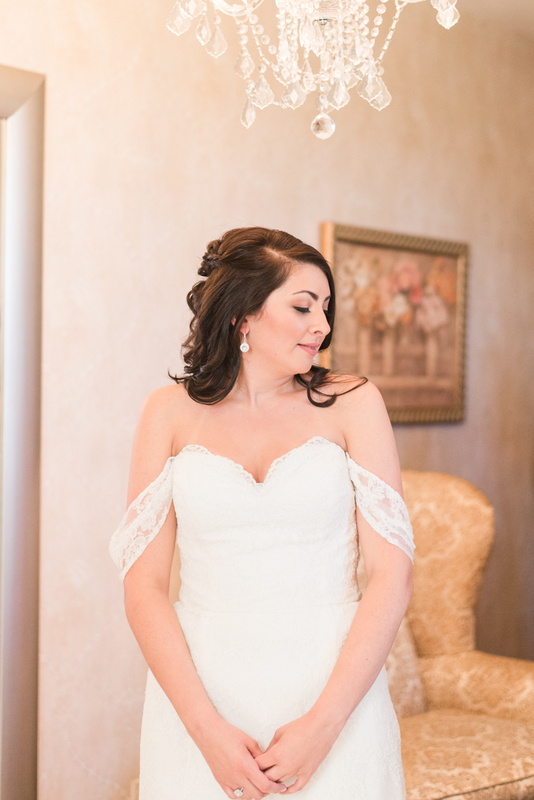 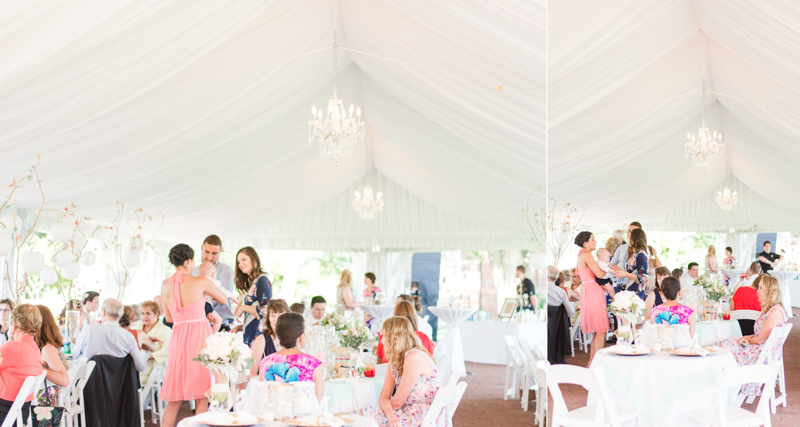 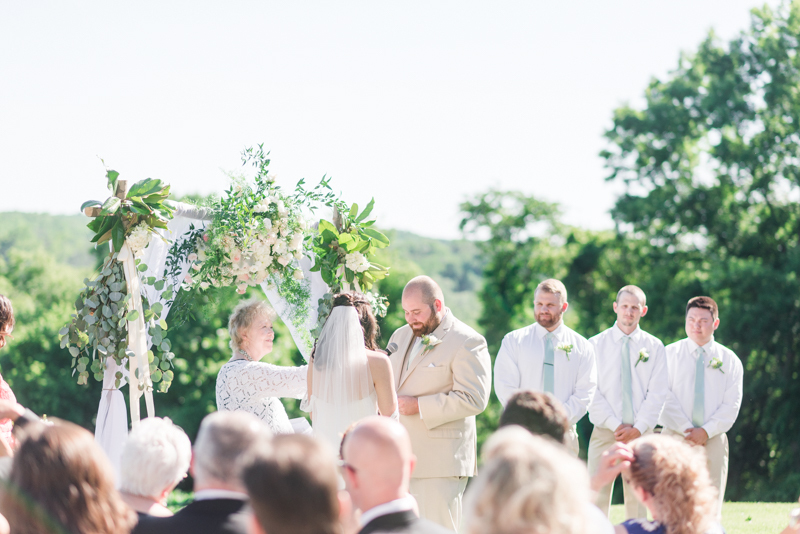 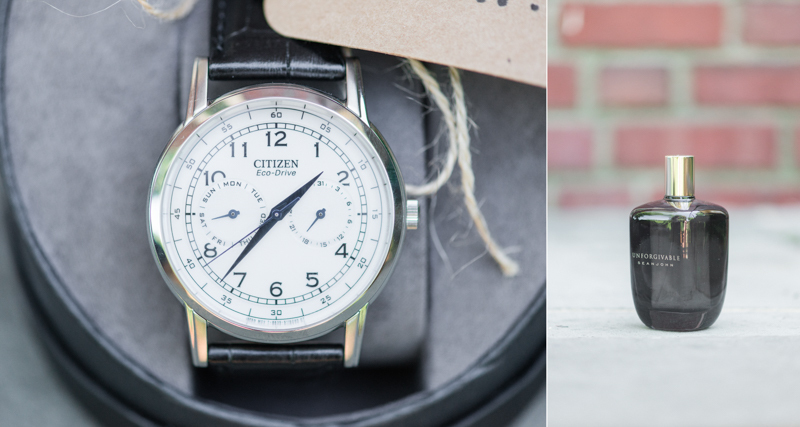 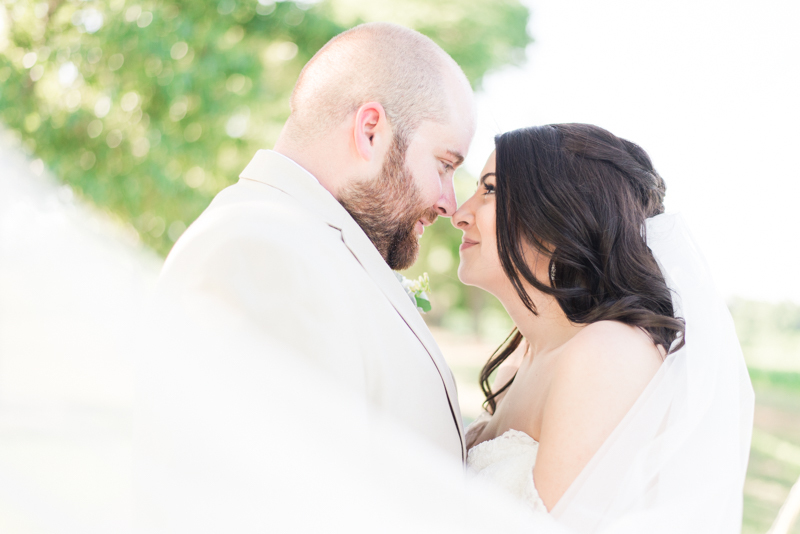 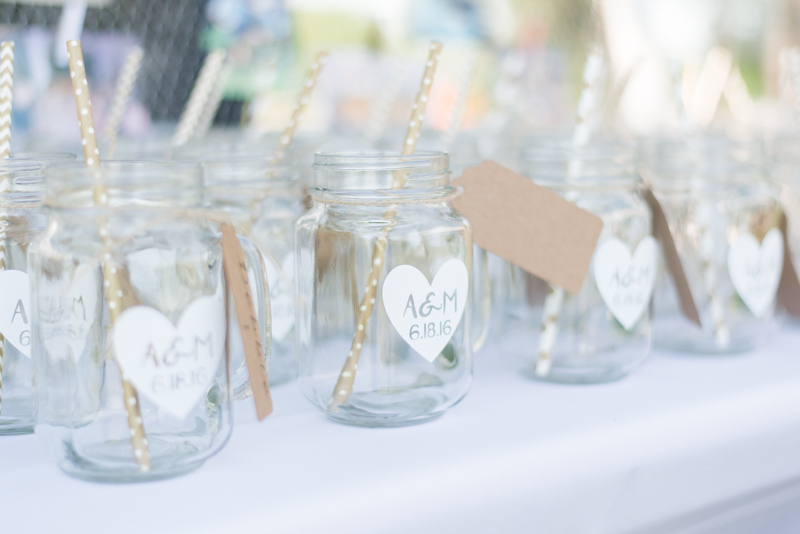 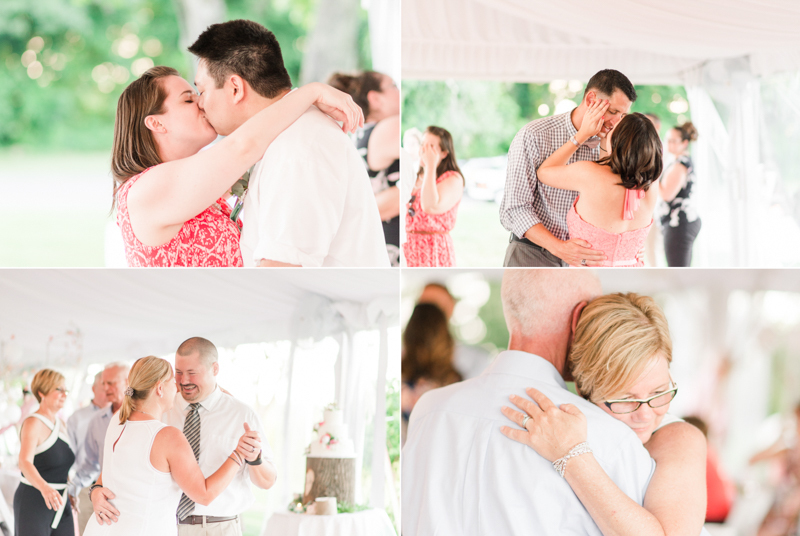 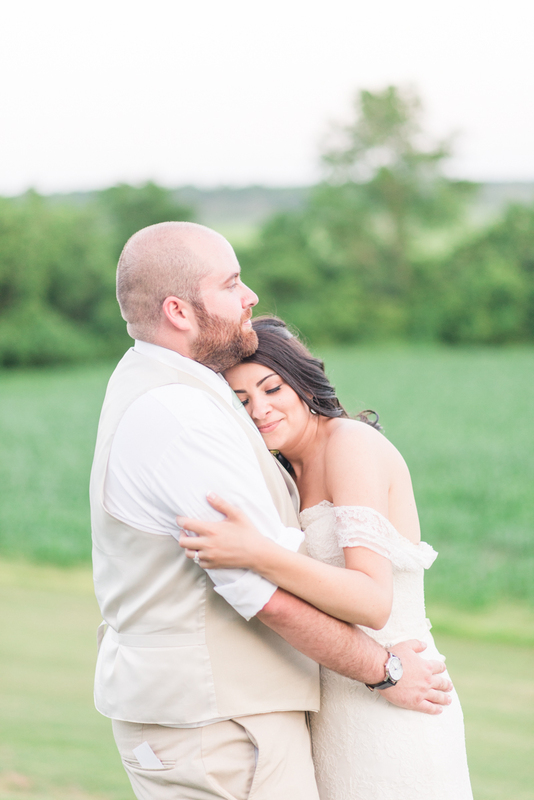 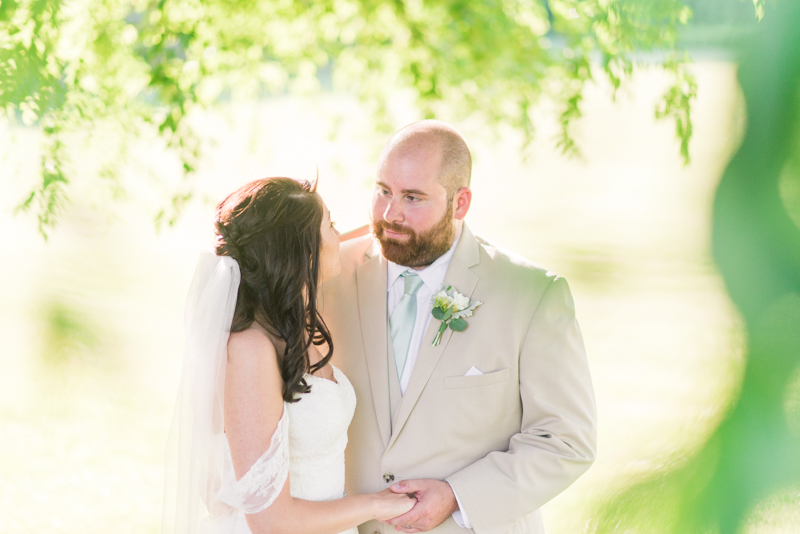 Christina's attention and care to the small things filled the reception and ceremony space with so much magic. 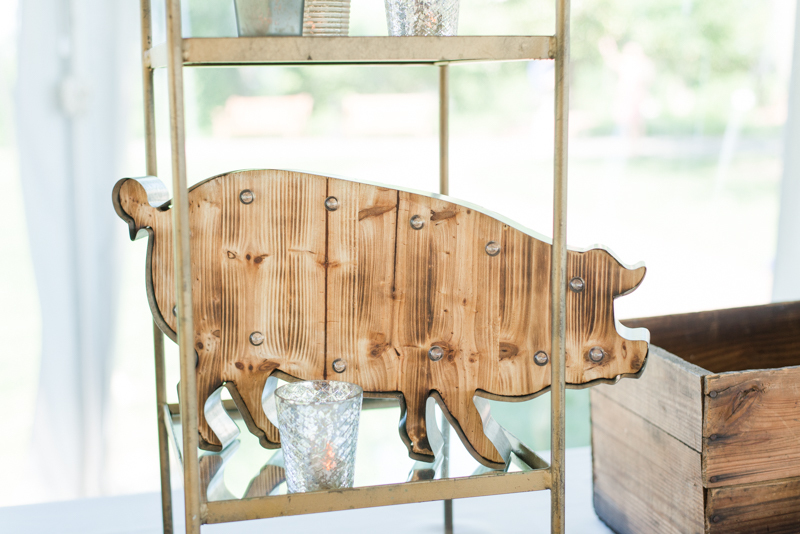 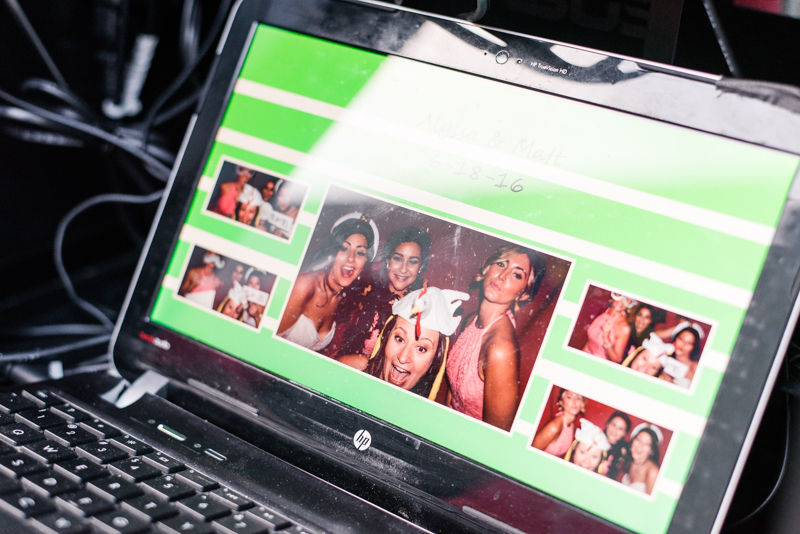 My favorite part of the decor was the marque pig sign that Christina found and knew would fit so well with the wedding. 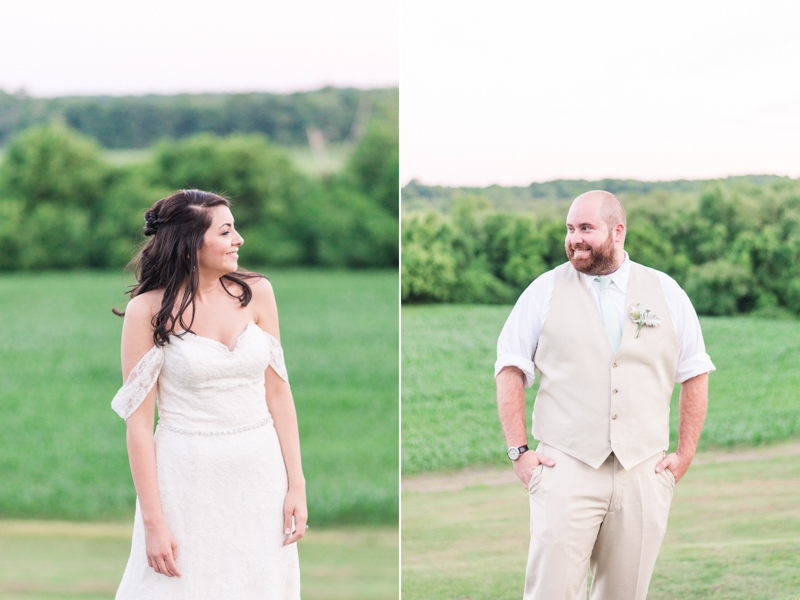 Coordinators like her are what take a wedding from orindary to completely mind-blowing. 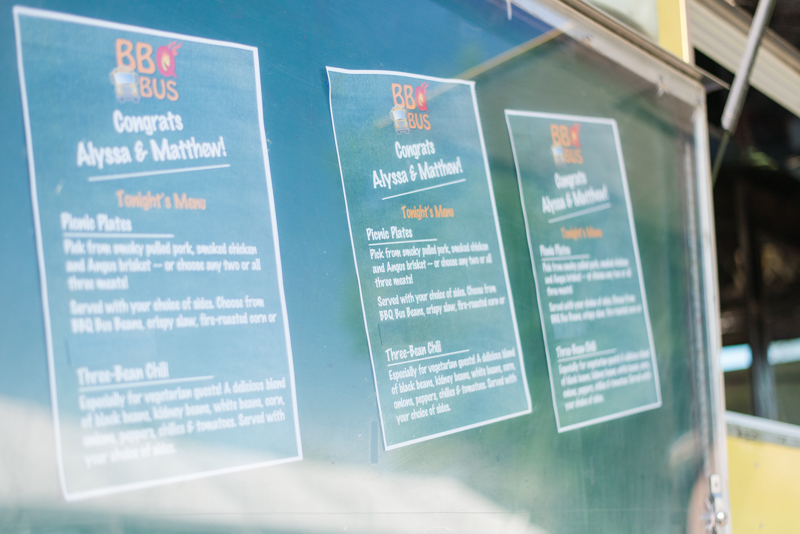 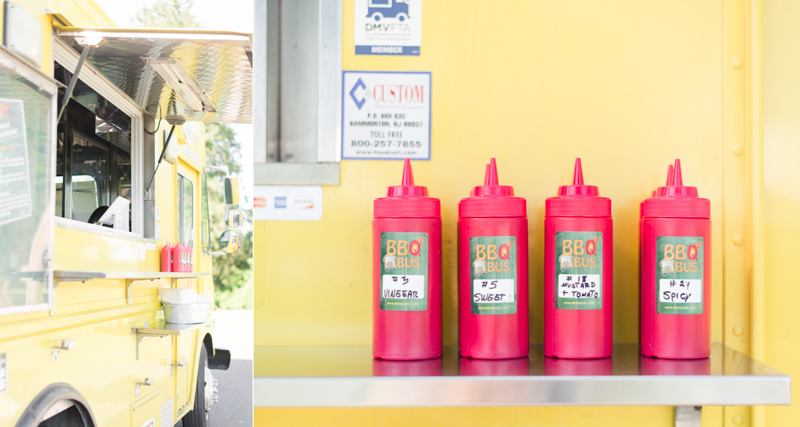 Speaking of that adorable light up piggy, the BBQ from the caterer, DC BBQ Bus, was on another level completely. 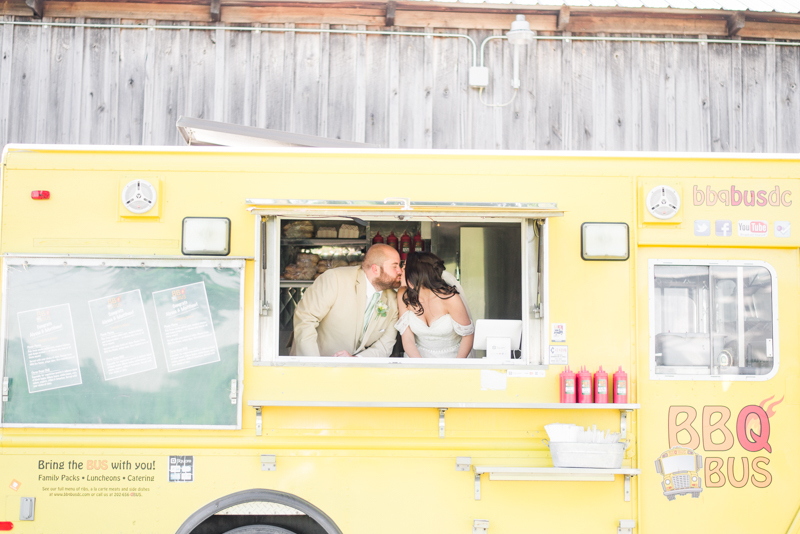 The owner, Che, was absolutely amazing and wonderful with Alyssa and Matt. 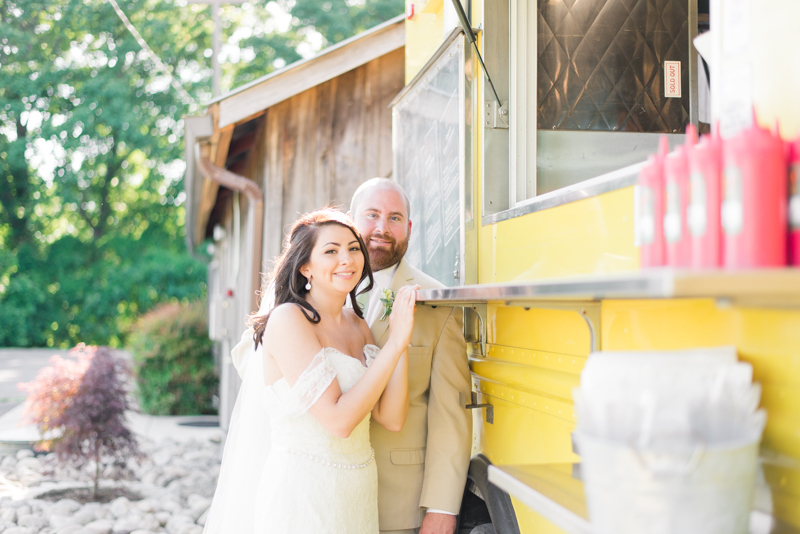 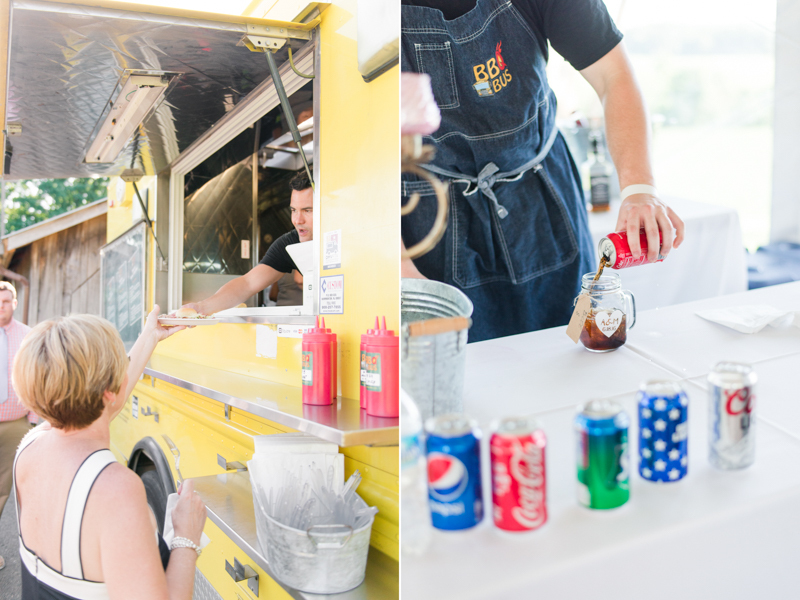 He even took to the time to make sure that we were able to get some really awesome shots of the them with the food truck. 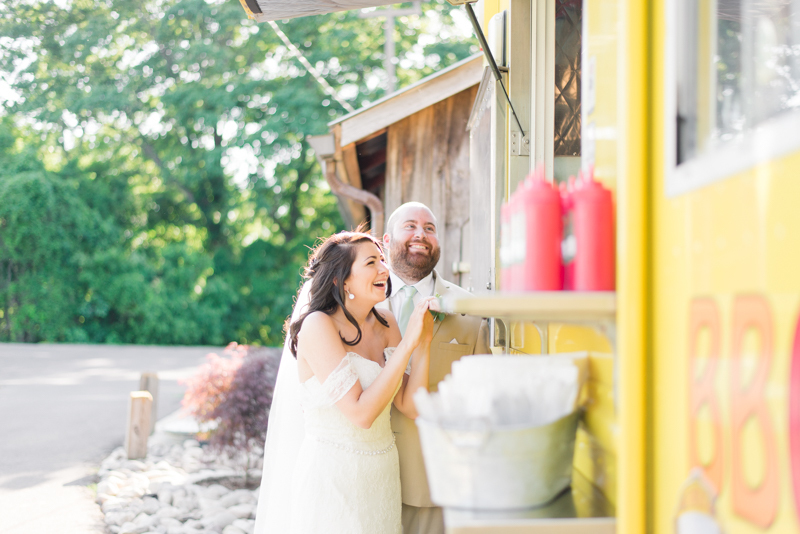 It's always cool when you leave a wedding feeling that not only was the couple fantastic, but the vendors were equally great to work with. 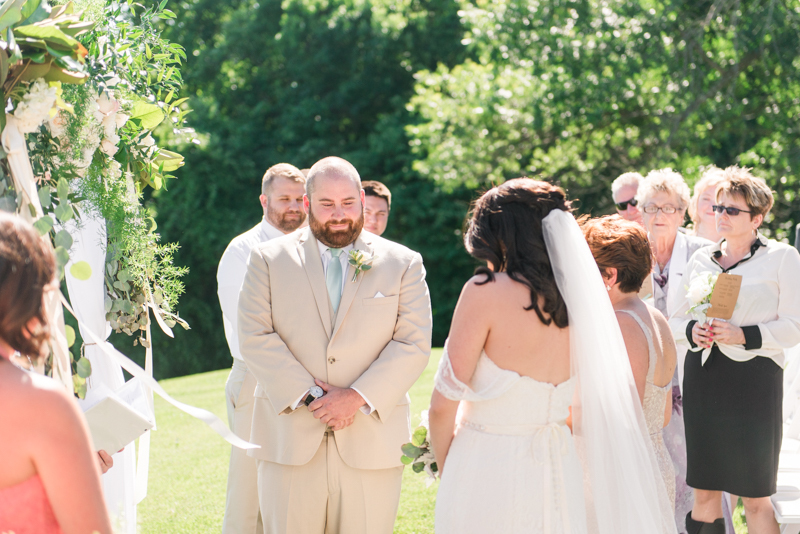 Getting to be a part of this most special of days gave me and Shawn the best feeling ever. 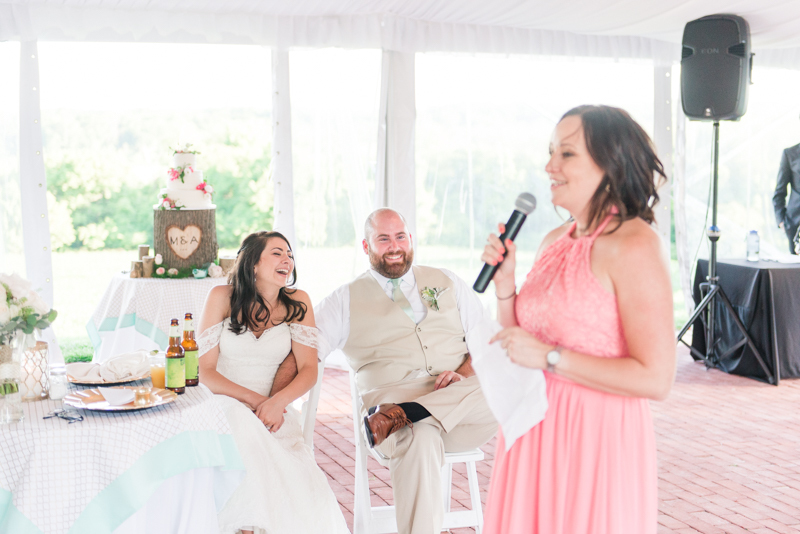 The most beautiful moments of this day came in the form of the speeches from the bridal party and Alyssa's mom. 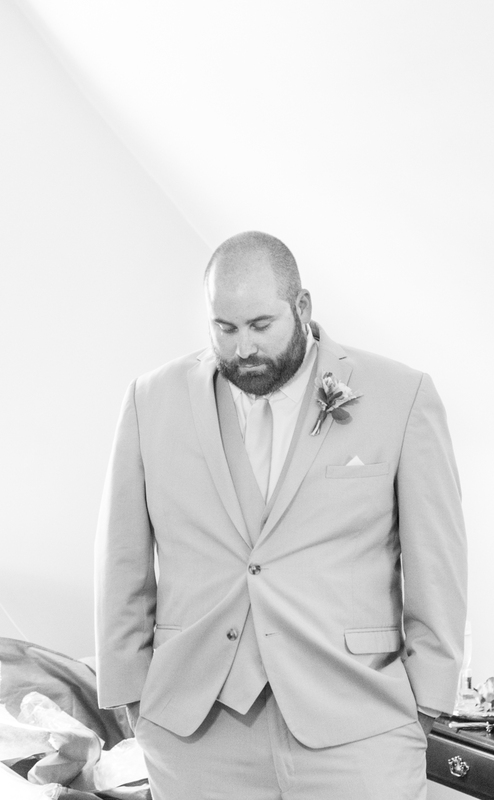 Unfortunately, Alyssa's father had passed away, and there was a lot of emotions during the day. 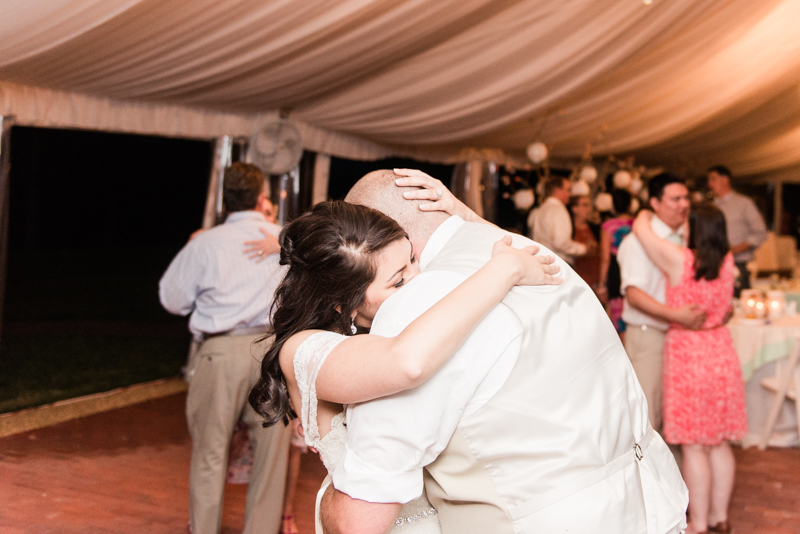 It certainly affected everyone including me since I could relate so much to how Alyssa was missing her dad. 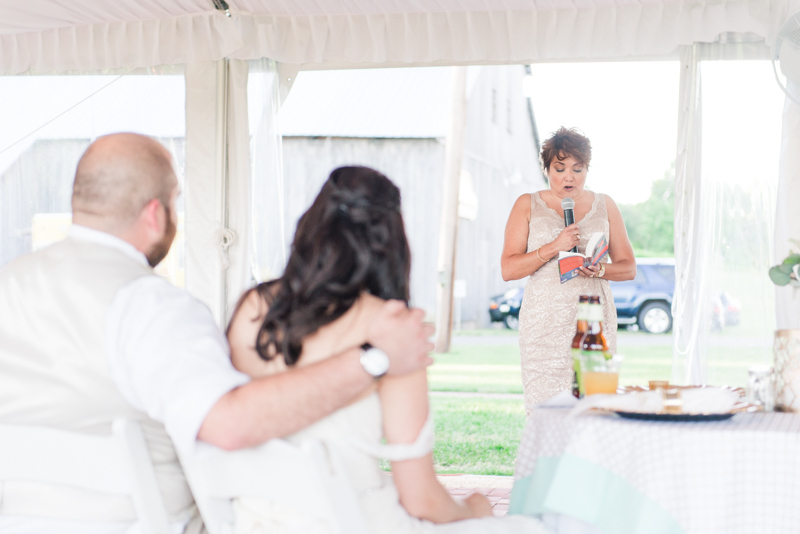 When Alyssa's mom, Yvette, got up to speak, she brought with her a small book that contained inspirational quotes. 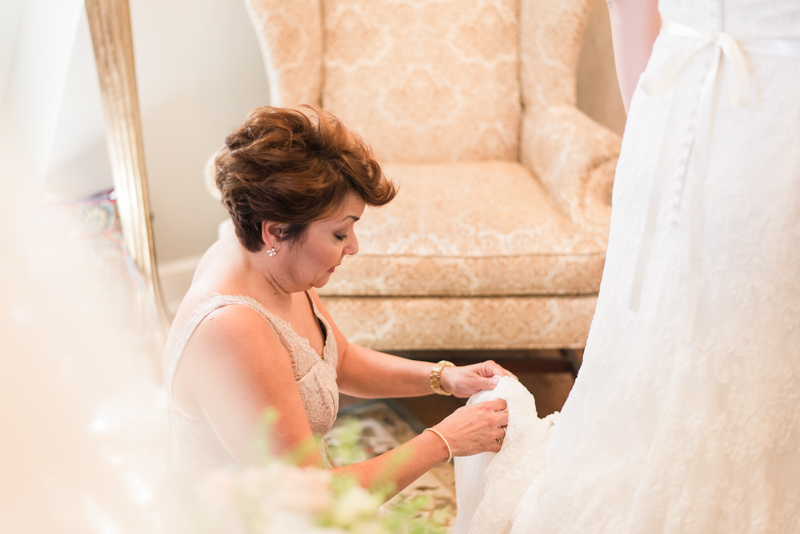 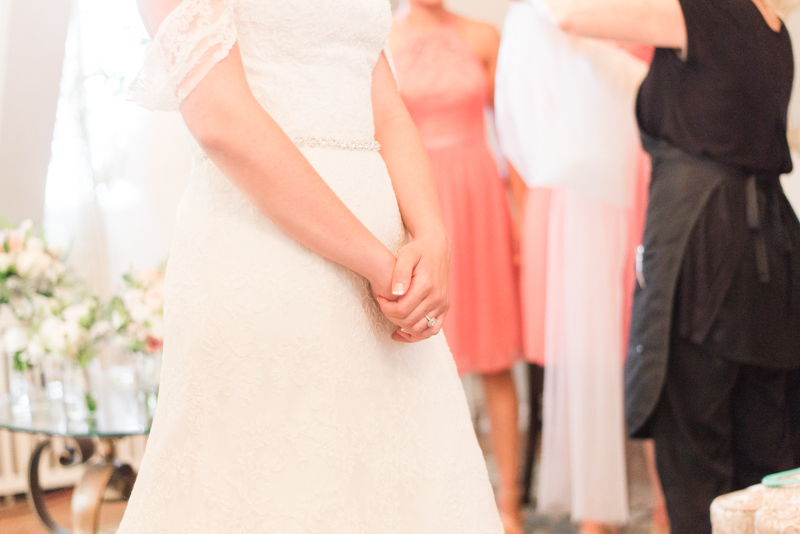 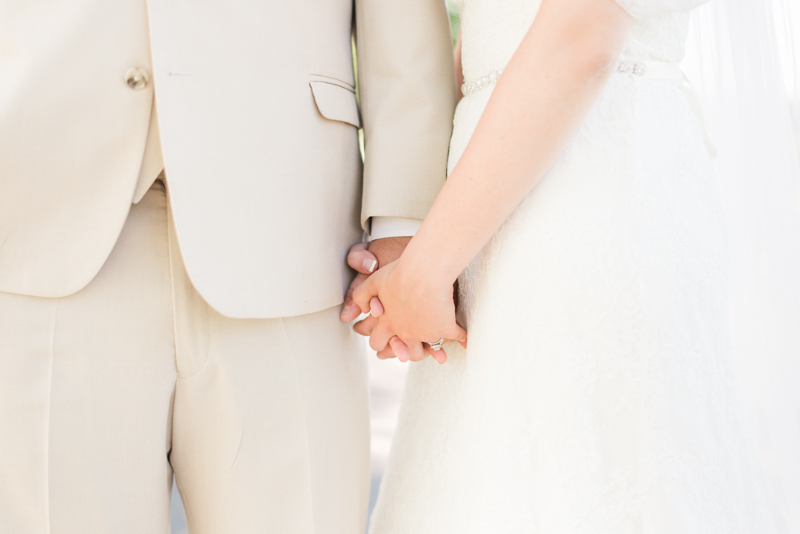 She mentioned how her husband always read these little verses, and when she was preparing for her daughter's wedding, she knew she had to find the perfect one. 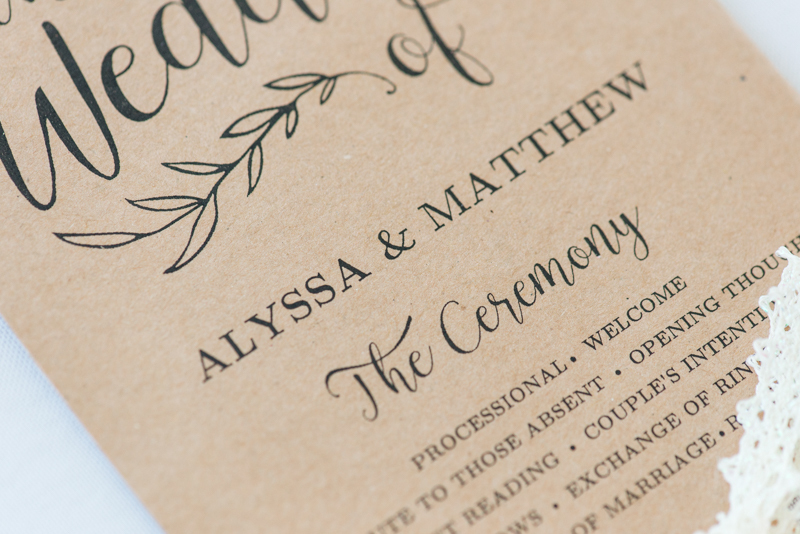 Sure enough, through searching through her husband's books, she found a single page that had the corner earmarked. 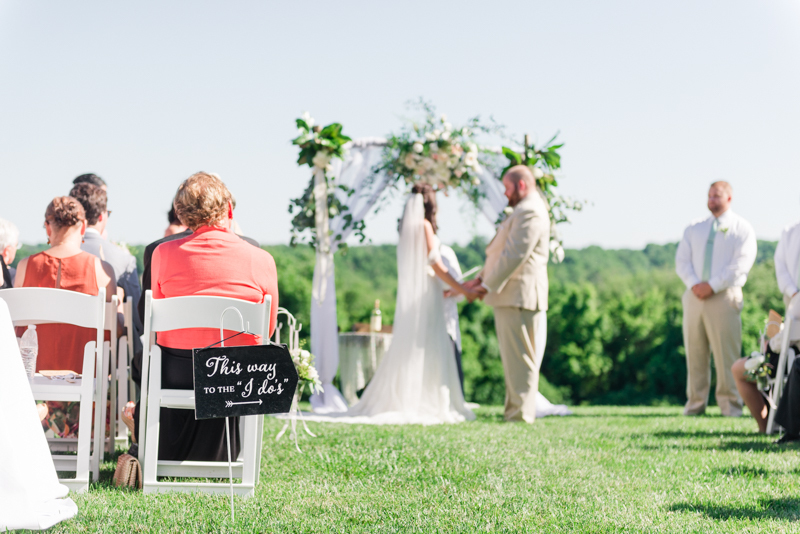 While reading the quote, it was easy to see just how much she was guided by her husband to read this particular passage to their daughter and new son-in-law. 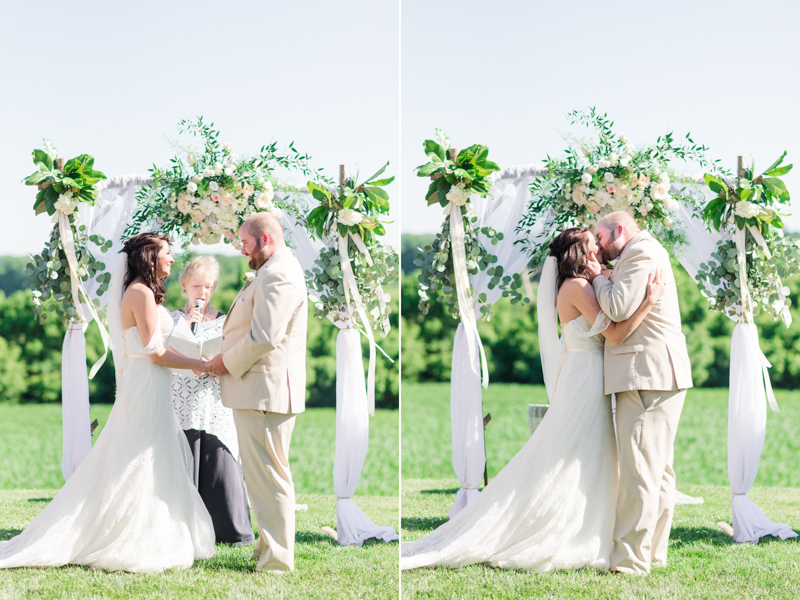 It was a beautiful moment, and it really shows how Alyssa's father was right there with them the entire day. 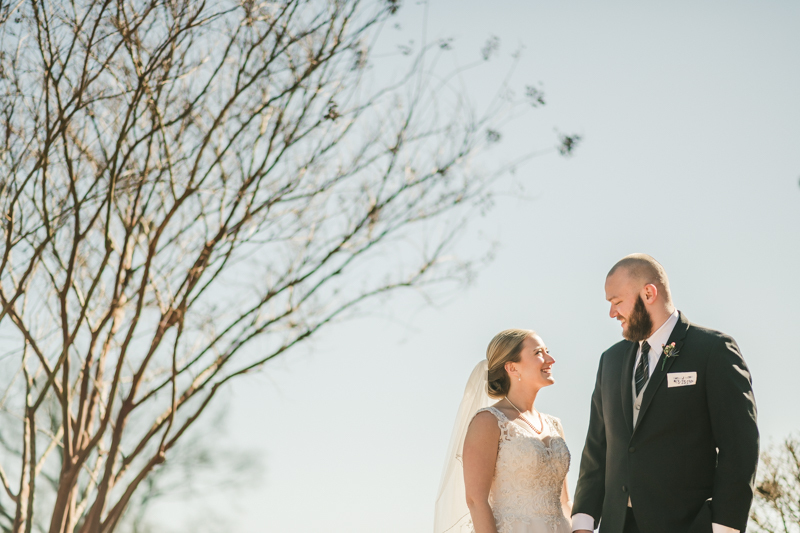 It's really amazing being able to celebrate these two. 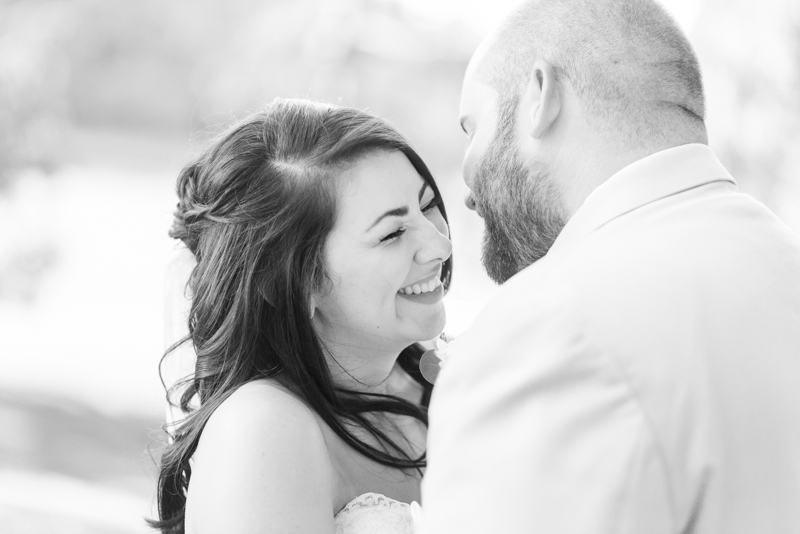 They have a such a wonderful type of love, and I'm looking forward to seeing where life takes them. 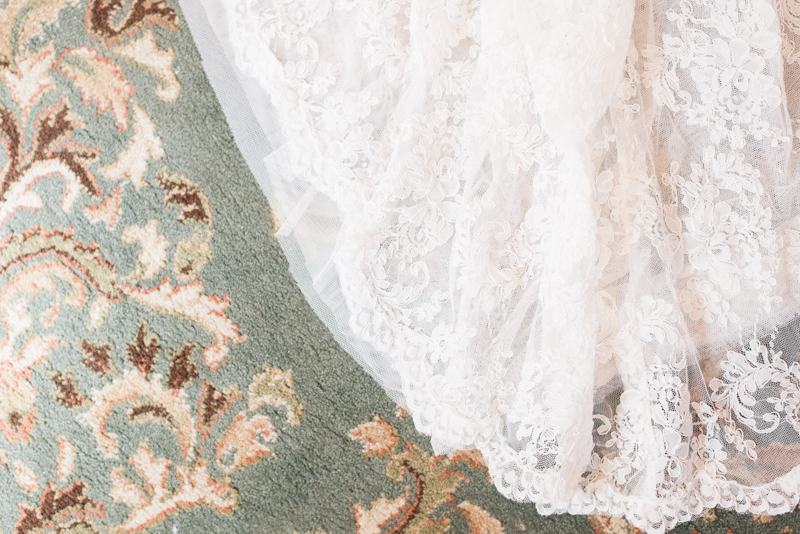 With all of that said: Sit back, relax and get ready to see one of the most gorgeous weddings of all time!